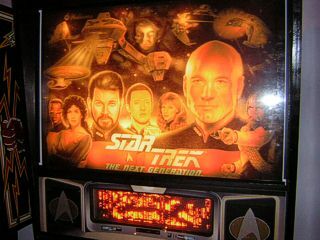 This page has all the "log entries" of the adventure that my STTNG pinball machine has been, and continues to be until it's in perfect shape. All the repairs, replacements, cosmetic fixes and touch-ups are collected here, Star Trek style. Although it is Friday 13th, I was surprised today by the machine arriving earlier than expected. The shipping company did a faster job this time and delivered the game just one day after they picked it up in Cologne. 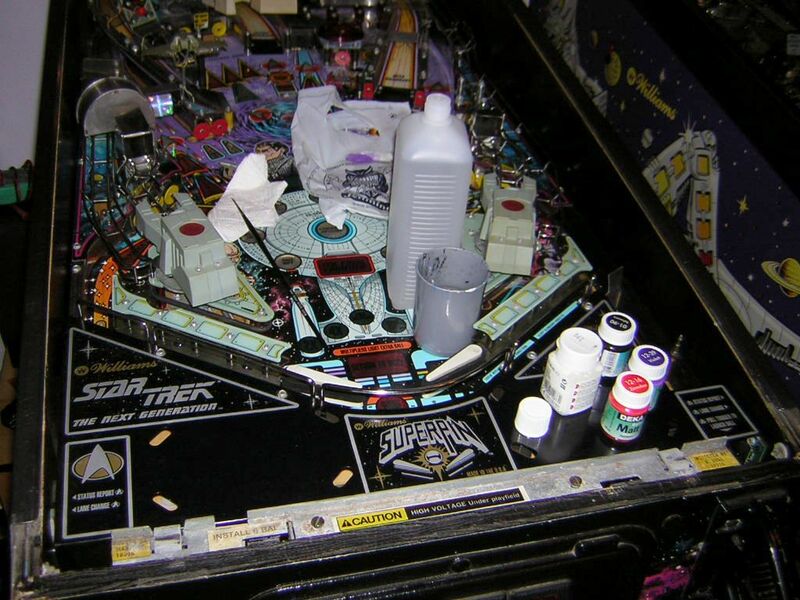 I'm facing space problems now because I'm in the middle of cleaning Diner and a lot of parts are spread around, plus Terminator 2 and Xenon are both still here and at least T2 needs to move out to make space for STTNG to move in. 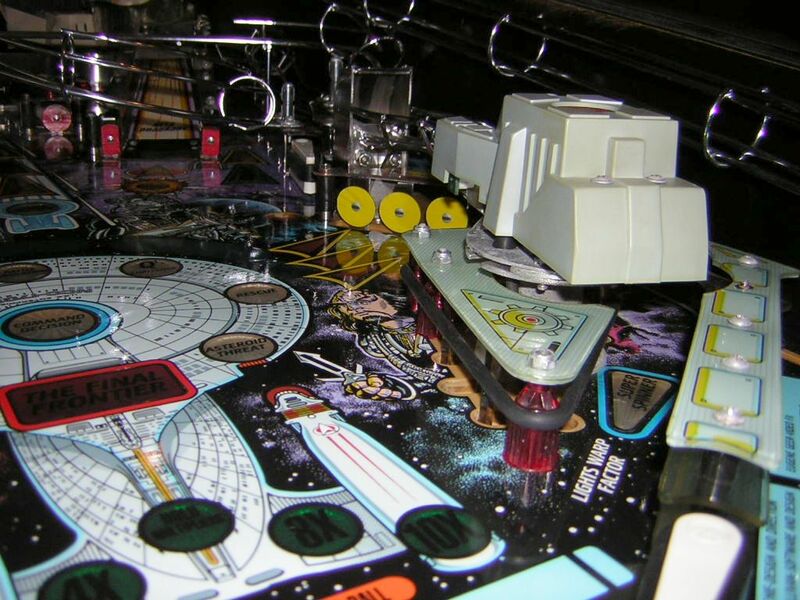 My friend Lars and I have arranged for tonight to move both machines into his transporter and drive them to a location with storage space curtesy of his mother where they will stay until they are picked up by the buyers. I've had a long wait time with Xenon and an arrangement has been made that it be picked up directly from there since nobody of the team around the buyer found the time to retrieve the game from my home for more than three weeks. Terminator 2 has been prepaid and will be waiting to be picked up later. 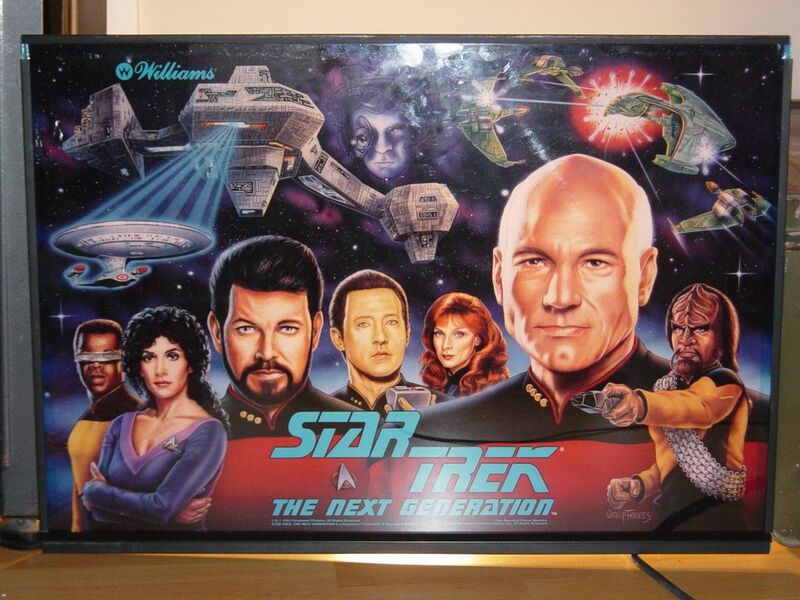 It only needs to move out now because of STTNG. The new DMD arrived yesterday and it looks fine, but I'm wondering about the already installed DMD in the machine. I was told that no display was inside and now I face this, but I assume it won't be working correctly since there are burn marks on the glass. For now, I'm analyzing the machine a bit before it is moved into my room tonight. 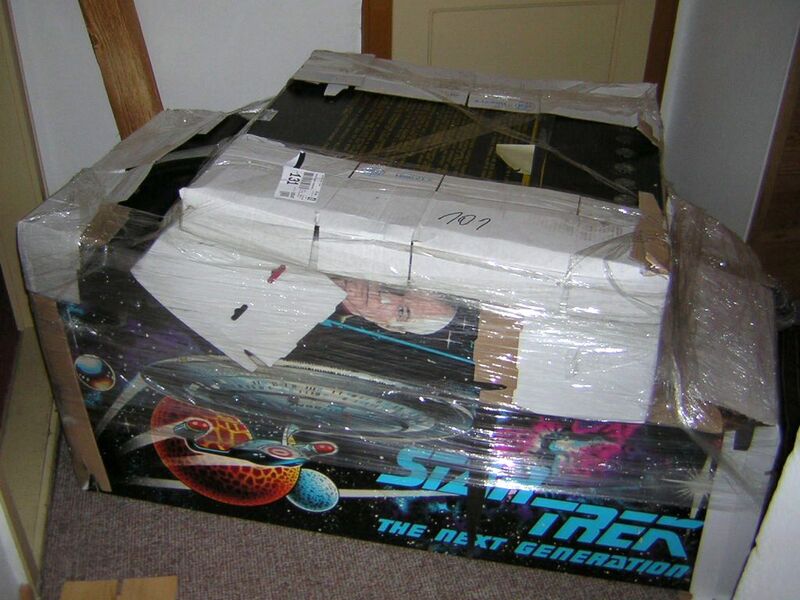 T2 and Xenon have been moved out, but before we attempted this, STTNG was moved into my room and positioned where T2 used to be. I established contact over the Internet with the indirect seller and he let me know that he forgot the legs and will send these to me free of charge in a package as soon as possible. While this is a little disaster, I will use T2's legs until the proper legs have arrived since T2 will wait a little anyway in its current location. A look under the playfield of STTNG reveiled several issues. First of all, two coils are com-pletely missing and need to be replaced. Of course, the coilstop of one coil is gone too and the wires are loose, but what's much more of trouble is that the Pinball Network forum members notified me that photos of the machine show an empty spot where there should be Williams' new ball trough opto boards which are used as a substitution for the regular ball detection switches that were installed before 1993. Since STTNG is a game with six balls, Williams obviously found it necessary to replace this conventional mechanism with an electronic version, and without the two small boards, which have optos (optical transmitters and receivers, LEDs) to detect the balls in the trough, the machine cannot find the balls and properly start a game. This means that I must wait for delivery of these boards, again from the indirect seller, since he told me that his friend who sold STTNG must have these boards lying around. I hope they will arrive here soon because I'm now quite disappointed about not being able to even start a game, but since the machine doesn't even turn on when I switch, I must find the cause for this first before any further steps can be taken. I also had to re-connect all the wires in the backbox myself since they were disattached, and the Fliptronics II board was loosely sitting on the sockets it should have been screwed to. This cheap buy turns out to be just that, cheap, and it will cost a little money and time to fix it. And something that freaked me out tonight was the broken pivoting mechanism Williams installed in this machine. 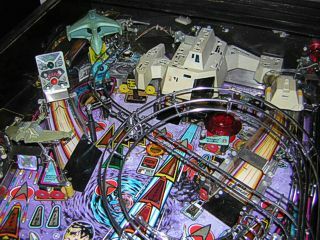 I have never dealt with it before and I don't clearly understand what the manual tells me, but I know that something has broken off and the right pivoting clamp is completely bent out of angle, so I battled with the playfield (which weighs double that of an earlier Williams playfield) for probably one hour to get it back in place after I had tried to fold it up and it had fallen into the cabinet instead of staying locked on the pivots. The mess I see is unbelievable and I have to find a way to repair this. I worked on the machine the whole day which was an excellent diversion from all things that could make me feel unwell. 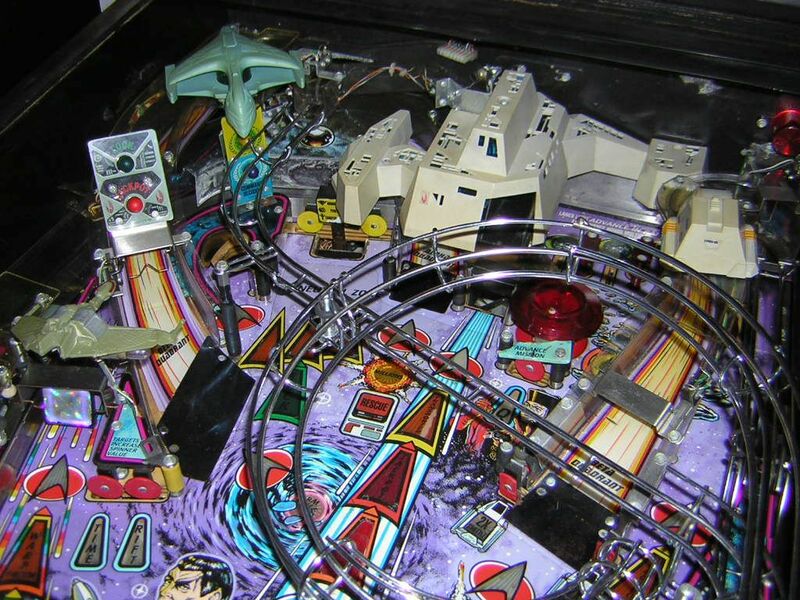 It was enjoyable to dive back into experimentation and analyzation again which has always been part of the pinball hobby. Since I have ordered new coils to replace the missing ones in STTNG, I decided to take two appropriate coils out of Black Knight 2000 and install them in STTNG so I will have it operational as soon as possible. BK2000 is rarely played these days, so it doesn't really matter. Plus, I had to extract BK2000's line fuse holder by opening the metal power box and desoldering the line voltage wires from the holder. 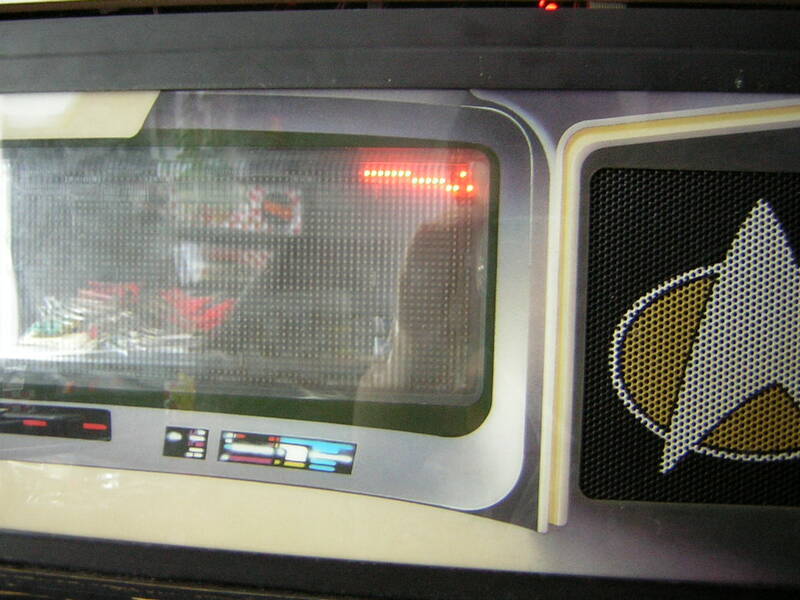 I did this because the fuse holder inside STTNG's power box was customized with a screw thread and I have absolutely no clue what kind of fuse would fit in there. I tried to find one in the nearby tools store, but was unsuccessful. 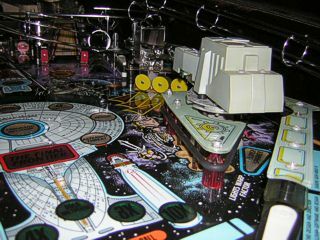 Because I wanted STTNG to turn on and see what it does, I had no choice but to install BK2000's Williams fuse holder in STTNG, and I will now have to order a fuse holder for BK2000 if I can find an online pinball shop carrying these. Until then BK2000 will not be operational. The first problem I encountered when turning the machine on was a loud buzzing noise from the speakers which made me turn the game off immediately. For quite a while I didn't know what was going on until I removed the speaker connectors and tried to get the game booting, however it did not boot until I removed the data ribbon cable from the audio board. I was notified by a forum member called drugi that all the sound ROMs were missing which essentially means no audio! Nobody could tell me whether this caused the noise and the boot failure, so I agreed with Frank to test some boards in his STTNG later this week. This will include the DMD controller board as well because the DMD is showing absolutely nothing, and the old one might be dead altogether, so we don't know which part is broken or incompatible until we tested the board with a working DMD. I say incompatible because I read that the brand of my new DMD (Babcock) might not work with certain machines because of missing voltage. However, the seller guaranteed that it should work. The funniest thing is that a single connector is missing in the backbox and I cannot find it no matter where I look. 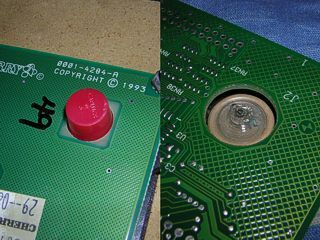 It's the connector which is probably responsible for the start, buy-in and trigger buttons, so until I have found this connector and put it back on the CPU board, pressing the start button will do nothing! 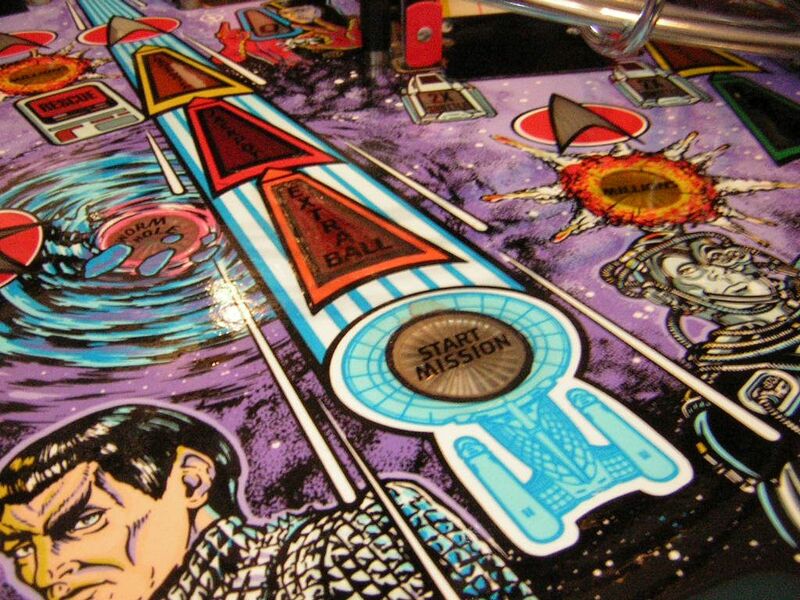 I forgot to mention yesterday that the playfield, which is a Diamond Plate playfield produced in series, does have a full coat of mylar on it. 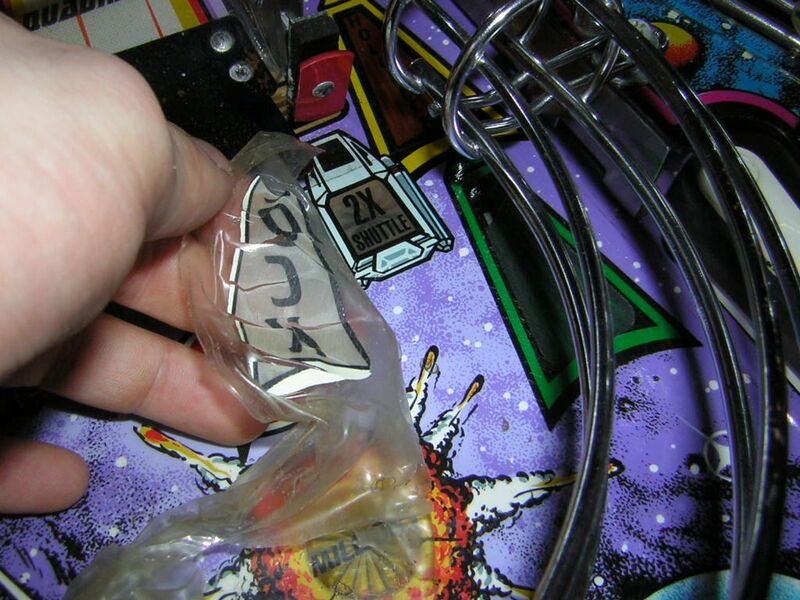 I don't know why this is, but I figure from some rather wavy-cut edges that this mylar coat was applied by an operator at some point and not installed in the factory. 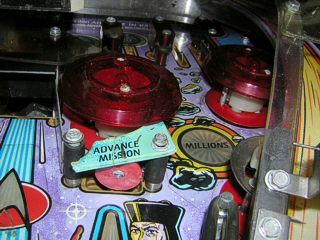 Since the playfield is practically not damaged because of the protection from the Diamond Plate coat, the mylar is simply a good double security measure and since it is neither scratched nor bubbled, the ball rolls excellently over it and I would gladly keep it on the playfield for additional long-time protection. However, there are two spots where the mylar seems to be mysteriously "ripped out" in areas the ball rarely travels with enough force to damage mylar. 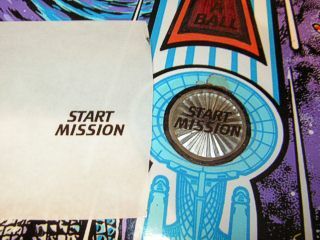 The Start Mission and Extra Ball lamp inserts in front of the upper center sinkhole have the mylar and coating completely removed together with their black outline and all text. Around them there are several small spots where the mylar (not the coating) is gone and dirt has sat down. The other spot is located just above the left flipper, next to the Return to Duty insert, however the coating is undamaged and none of the completely black paint has worn off. I wonder how such spots could have developed, but it will mean mylar removal sooner or later so I can retouch the inserts (at best with text decals, not hand painting). 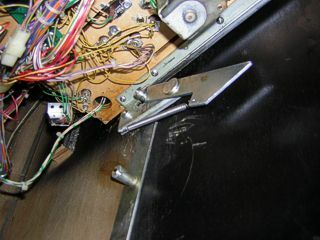 Also, the machine must have been standing in a wet or very cold environment for a while because all the metal components under the playfield have corrosion on them. 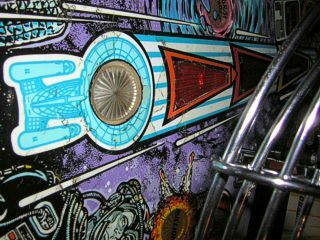 The screws on top of the playfield don't look much better either. 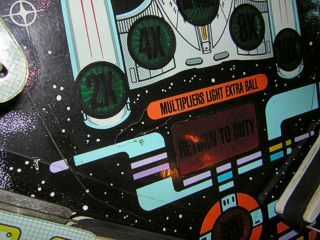 It's surprising that the habitrails and the contacts on the playfield were not affected by this, but I won't ask for it. 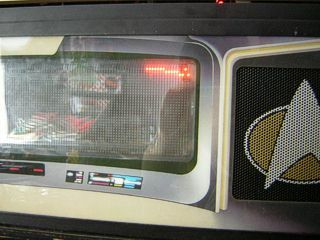 Frank and I tested the DMD board in two machines, the second being his STTNG, and the DMD failed to show anything but a few small dots occasionally which did not move. The audio board has been upgraded with sound ROM chips and now boots fine together with the game, and we now have audio. Because Frank said he doesn't play his STTNG at the moment, he let me keep the ROMs and said that I could send him the new ROMs I will receive from the seller of the machine. This makes three parts I need to receive from him; the ROMs, the opto boards and the legs. On another note, the old DMD is not totally wrecked. 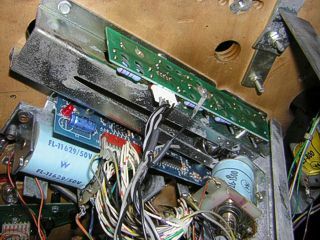 It showed unstable garbage at all times which changed along with the animation that the CPU board sent to the DMD controller board. 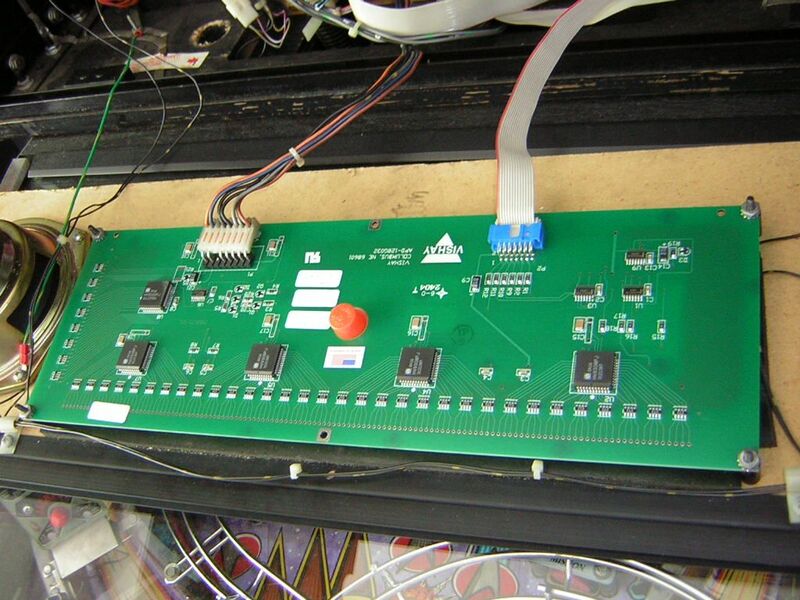 Of course it won't show anything with my failed board except for the few dots, but at least we now know that if my DMD board had worked, I should have seen garbage animation on the old DMD, and possibly a full picture on the new DMD. The problem now is that the new DMD does not work. Judging from my search for the error, the DMD is outgassed because the glass bulb on the back side of the DMD is clearly broken and the glass is open, meaning all plasma gas has been released. I know that it was like this when I received and unpacked the display, but at that time I didn't consider this to be a problem. It must be the seller's mistake to send a display without the red plastic protection topper which normally covers the glass bulb and cannot be removed easily. I have informed the seller of this mistake and I hope that we will find a solution (he seems to try to deny that it was his mistake). 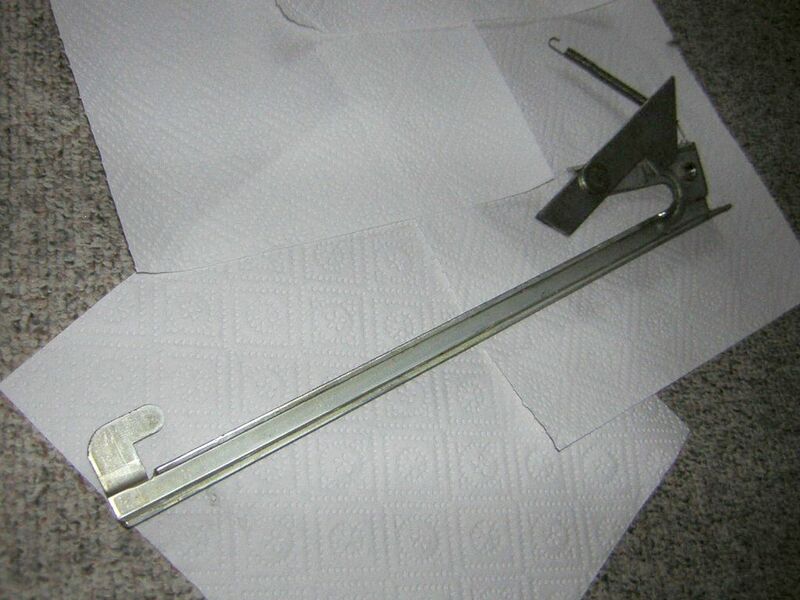 The missing lockdown bar has arrived; it was sent to me by a forum member who offered it free of charge. It is not a complete widebody lockdown bar since these are hard to find, but merely a widebody metal handrail with the holding gear screwed on it from the underside. It doesn't look all to different from a normal widebody lockdown bar, though. With the working audio board and using Visual Pinball with the STTNG game ROM emulated on my PC, I was able to test all the solenoids in the machine despite the blank display. I found out that all solenoids worked except for the flippers and the two under-playfield diverters which direct the balls to the correct outholes and locks. The buttons don't respond either, and while I know that the missing connector is responsible for the nonfunctional start, buy-in and trigger buttons, the dead flipper buttons and coils could mean that even the Fliptronics board could be defective as well. As Frank said, he thinks that my STTNG machine might have been tampered with before it was sold to the previous owner because two or more defective boards are theoretically not possible - you would stop playing the game if one board was broken and thus it would be impossible to break another. He believes that non-working boards might have been installed in the machine just like the two coils were removed! The Advance Mission plastic which was broken when the machine arrived has been replaced by a nice reproduction plastic that was sent to me for free by another forum member. I appreciate the help and assistance I have so far been receiving from the forum; I'm sure that once the game works, they will all be relieved to see the work paid off. Today I tested all the transistors on the power driver board, the Fliptronics and the 8-driver board. Especially the 8-driver board, which is a small auxiliary power driver board for additional solenoids the normal power driver board cannot handle, seems to be broken as it drives the two under-playfield diverters which don't work. The flashers and drop target coils driven by the board are working, though. I assumed that transistors might be open causing the dead coils, so I started testing them all with my newly-purchased digital multimeter, a device to test and measure all kinds of eletric and eletronic values including voltage, resistance, diodes and continuity. I already faced the problem of not having a multimeter when I had to test the boards of Xenon, so it was finally time to buy my own multimeter this time. Apparently all the transistors on the power driver and Fliptronics board are working; however, I got a wrong value for one of the two transistors on the 8-driver board which I'm concerned about. Still, one transistor cannot drive two coils, so there must be another reason. 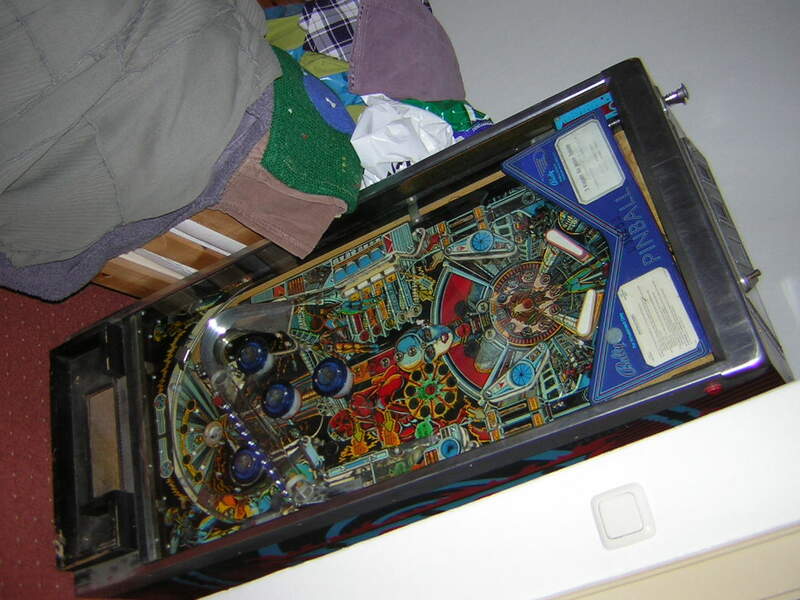 Forum member drugi who notified me of the missing sound ROMs had offered me to look over my broken boards this week because he is in Berlin for 14 days, and as I learned today, he repairs pinball machines all the time and is a professional in circuit board repair. When he was here today, he concluded that the old DMD has bad chips on the display's board which cause the garbage on the display, and he replaced both the DMD controller board and the Fliptronics board with working boards which instantly resulted in working flipper buttons and coils as well as the expected animated garbage on the DMD which was proof that the new board was working. He said he would take the broken boards home and repair them, and he wanted only 20 Euros for the replacement. So, despite being unable to read the display, I now have a functional DMD controller as well as working flippers. 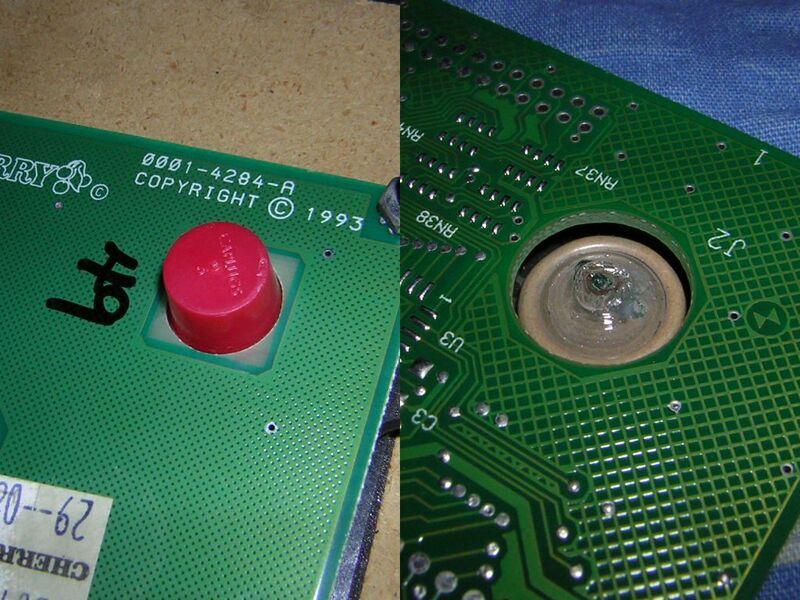 He also discovered the missing cabinet button connector stuck under the CPU board! 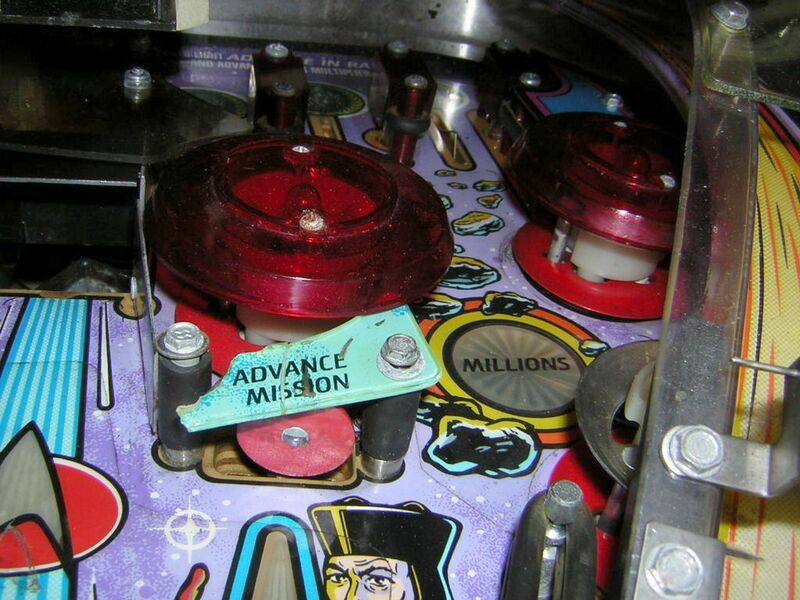 Installing it actually made it possible to start a game, however there were no balls in the trough at this time and the machine instantly got stuck in the opening sequence where it would not react to any buttons, not even the ones in the coin door. 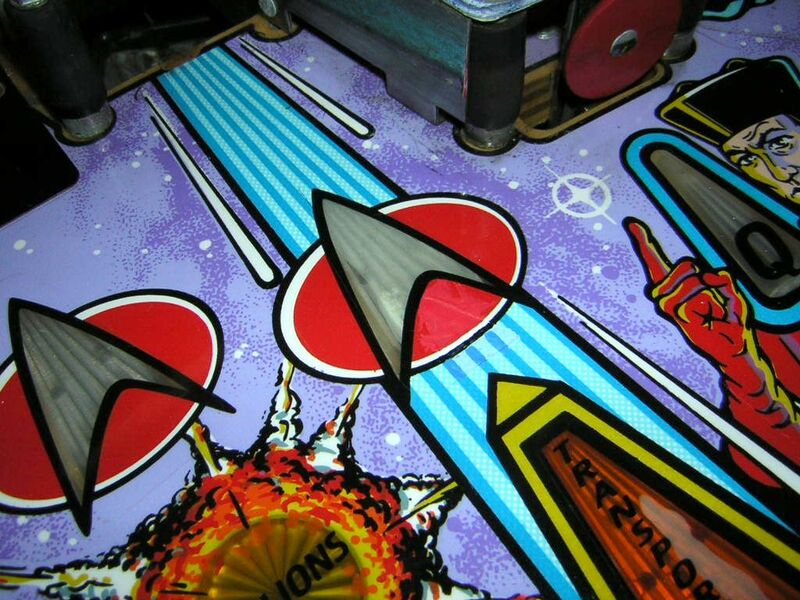 Another problem now is that activating more than one flipper at the same time often results in a complete game reset, meaning every-thing dies for two seconds and the machine reboots. This happened occasionally before when I had the broken DMD board and display connected to the circuit and I thought it had happened because of this since I read that a failing DMD consumes more power than a working one, meaning overuse of voltage which must be continuously flowing at five volts to the CPU or otherwise it resets. Now that the flippers caused the resets as well, my new friend told me that it's almost completely sure to be caused by two bridge rectifiers on the power driver board which regulate the voltage going to the CPU and the low voltage switches. He said that this is a very common problem which I could confirm for myself by reading various texts and threads on the topic. This probably means that I need to order two new rectifiers and install them. 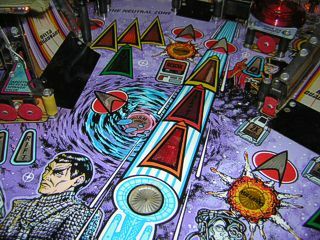 The bad news of today is that the diverters under the playfield still don't react, so it must indeed be something with the 8-driver board. I attempted to fix the 8-driver board by removing the transistor which tested bad earlier, and I discovered that this transistor was not a TIP102 like it should have been, so I replaced it by the working transistor numbered Q12 which is not used on STTNG. I desoldered it and moved it to the position where the old transistor used to sit. Because some of the board's traces have been heavily resoldered with small metal parts on the back, I suspect that this board was "fixed" earlier and I think that it might never work perfectly again because too much damaged occurred. However, all the traces and connector pins tested fine, so it could either be the chip or the resistors which make it impossible for the CPU to communicate with the diverter coil transistors. Testing the transistors and their continuity to the diverter coils by grounding the transistors manually resulted in the coils firing, meaning that everything in the electrical part of the board must be intact and that it can only be the connection between the CPU and the transistors which causes problems. I exchanged the ribbon cable with the one from The Machine to no effect and I heavily suspect that the chip on the 8-driver board might have failed, but it isn't impossible that the CPU board might be broken too. I could test it later to be on the safe side. 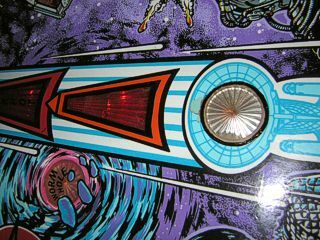 I also discovered a bad mistake when I tried to shoot balls around the playfield with the flippers in test mode: I saw that the lower right flipper, which had the Black Knight 2000 flipper coil installed, was very weak and could barely shoot the ball into the top center sinkhole. My STTNG is one of the first models which have the stronger prototype flipper coils installed, and these were later replaced by the standard WPC coils labelled 11629 with a blue wrapper (the prototype coils' label starts with 17 instead of 11 and the wrapper is blue too). Still, the difference in strength between the usual and the prototype coils couldn't be so much that the coil from BK2000 would not have enough power to shoot the ball where any other standard WPC coil could! I wondered whether the coil was actually a standard WPC coil or a weaker one, but it did have a blue wrapper which normally indicates it as a 11629 type coil. However, when I looked for the number, I found it to be 11630 which means it is actually a red wrapper! 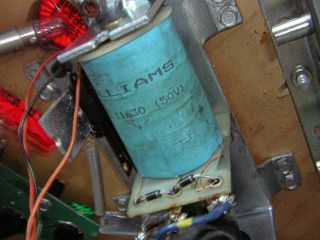 Red coils are the standard System 11 coils (to no surprise as BK2000 is a System 11B game) and are much weaker than the WPC 11629 blue wrapper coils. The coil from BK2000 was incorrectly wrapped in blue and led me to believe that it was a WPC-type coil with more power because it was installed on the upper playfield for the single flipper and at the time I believed it to be necessary that a stronger coil was installed up there (since the flipper needs to make loop shots all around the upper playfield which could require more strength). 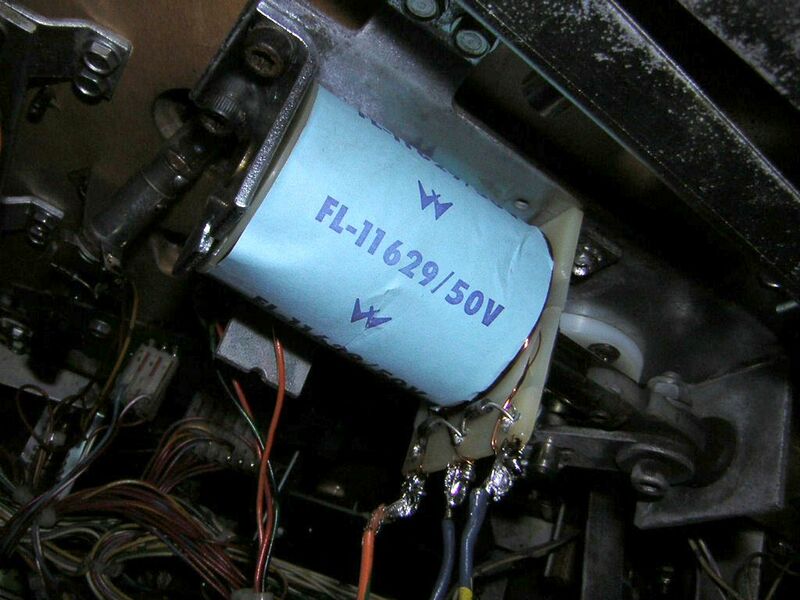 Apparently I was wrong with that assumption and defeated by the blue coil wrapper, and because I now had the new WPC 11629 coil which I ordered and originally wanted to install in BK2000 (imagine the results! 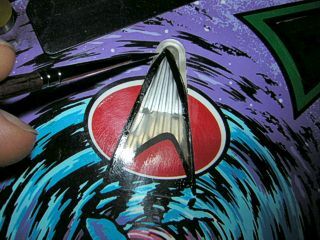 ), I could replace the odd coil with the right one to give STTNG's right flipper the power it needed. Surprisingly, the resets that happened when I activated two or all three flippers at the same time have now vanished! 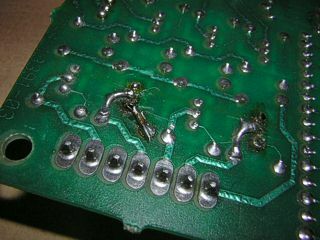 I blame the odd coil for causing them, however the forum members warned me that this might not be the solution. Obviously the forum guys were right again because the resets returned after I established the GI. 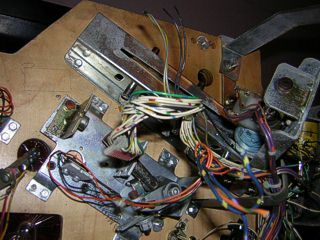 Since the connectors for both the back-box and playfield GI are gone and the wires are loose in the backbox, I decided to go the same route I went with Diner's GI and I soldered the wires directly to the pins on the power driver board. 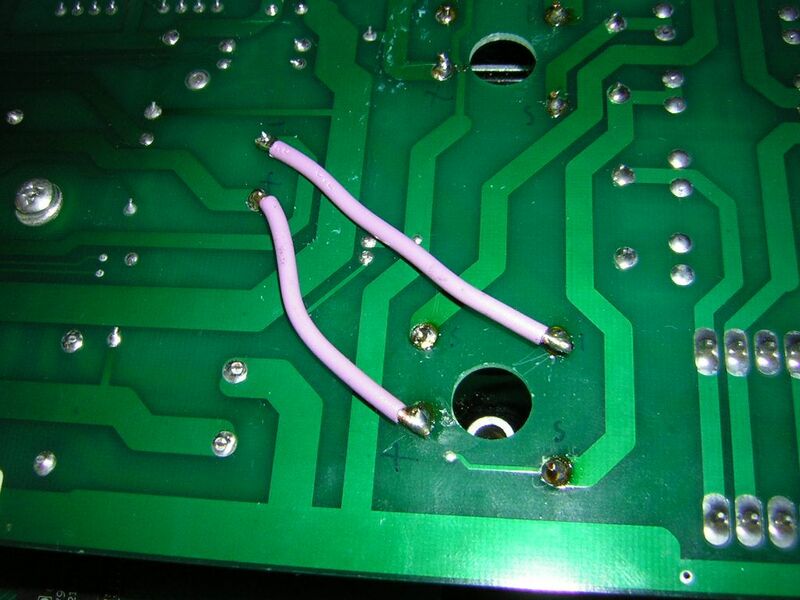 Again, soldering is not the best solution and it doesn't always work safely, but it did work here, partially because the ends of the loose wires were fitted with crimp-style pins which easily accepted solder (I couldn't get the blank wires to accept solder on Diner). The GI lights up beautifully now, but the resets appear again in relation to the flippers. I don't know whether the GI is responsible, but it requires me to order and install two new rectifiers which will hopefully solve the problem. After the transistor change on the 8-driver board, the voltage on both coils' wires has become constant which signalizes a change, but as I said before, it didn't make the diverters work. The game now shoots two balls out of the trough after it boots and since the diverters can't lead them to the locks, they are released again on the left outhole and shot into play again from the trough. This cycle never ends unless I open the coin door to interrupt the high voltage circuit and wait for five minutes until the CPU stops asking for balls. At any rate I have almost given up hope for the 8-driver board and placed a search call on the forum. eBay isn't my friend today, but it seems that this board is not easy to get anyway as it was used on only a handful of WPC games. A more pleasant fact is that I managed to repair the pivoting mechanism of the playfield which cost me my nerves earlier. I removed one of the metal pivot posts from the intact left side and screwed it onto the loose screw on the broken right side so that the balance was established again. 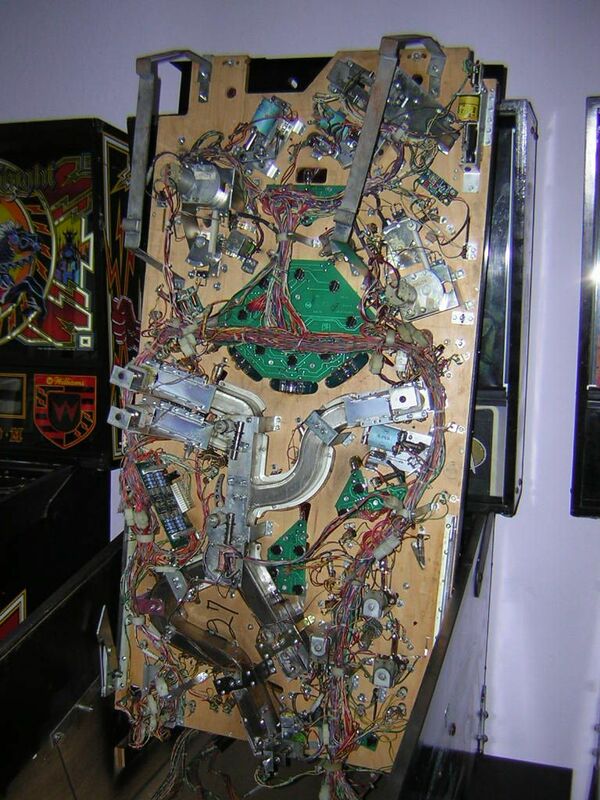 I could now pull the playfield out and lift it with the left clamp locking it in place and the right side leaning on the new metal post and the right cabinet wall. 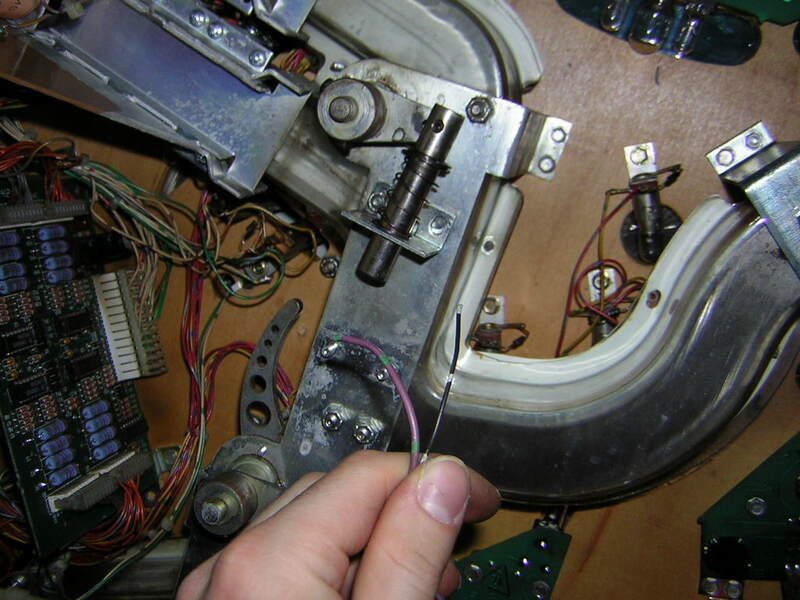 Today I removed the whole clamp assembly on the right side and used a hammer to correct the side bending so that the clamp now fits in again and locks the playfield on the right side like it should. 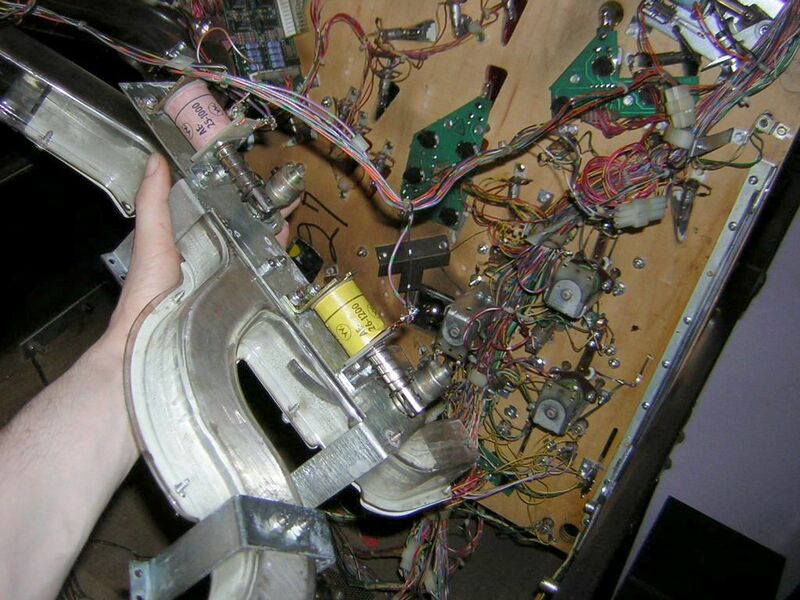 The only problem now is that the forward bending is incorrectable with a hammer which means that I have to lift the playfield up a few centimeters to lock it in manually before I can fold it up. If I simply drag it out like the manual wants it, the right clamp will get stuck under the front metal post because of the incorrectable bending. Still, this is a lot better than it used to be. 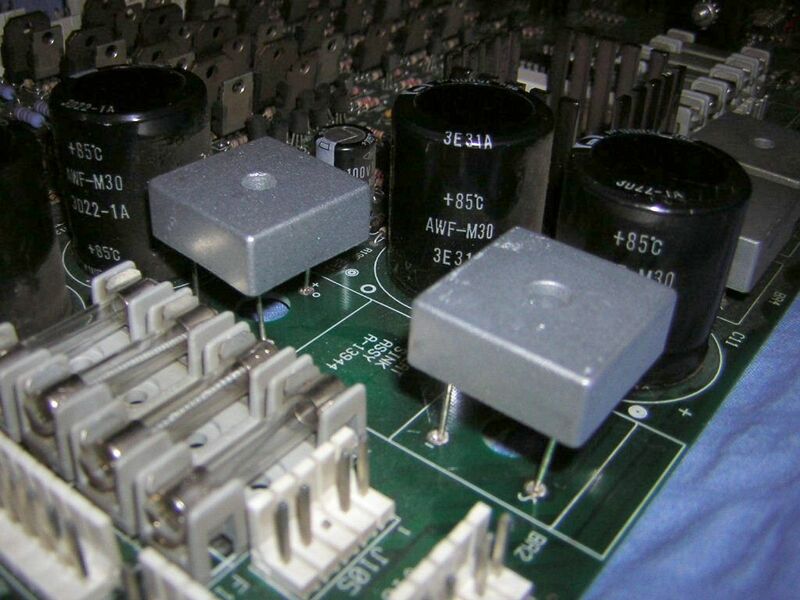 The new bridge rectifiers arrived and were installed by me, and to my delight they solved the reset problem. I can now punch those flipper buttons without being "punished" by the game, and the intermittent resets in attract mode are gone too. It was surprisingly easy to install the new rectifiers after what I read on the forum. The harder task was getting the old rectifiers off the board first! 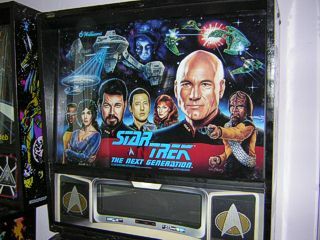 Since the game ROM of STTNG searches for balls when it doesn't know where they are, you have to press the start button quite a number of times, but eventually a game can now be regularly started and played, however if more than one ball is in the trough, the game will throw them all out one after the other and shoot them into play which means endless multi-ball. 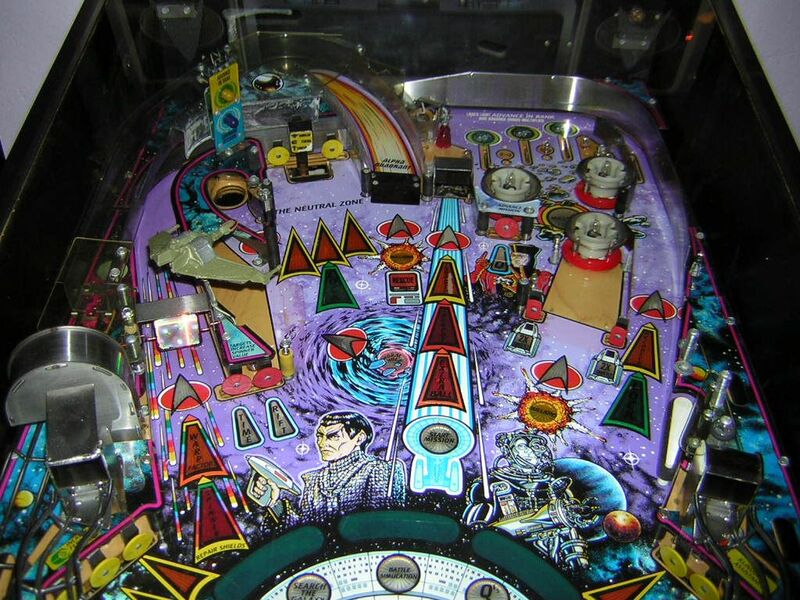 The game is "playable" if only one ball is in the trough, but the game keeps trying to shoot more balls into play and this means that the first ball can never end; it's just shot back after it drained. 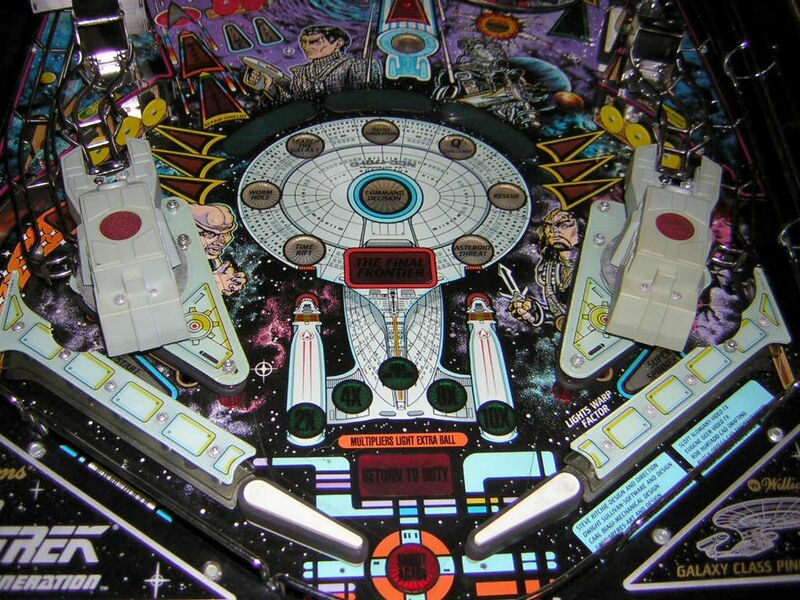 Also, the locks for Borg Multiball are useless because of the nonfunctional diverters. I also discovered that some switches didn't react in gameplay, so I proceeded by testing all switches and eventually found out that a complete row in the switch matrix has stopped working, including the left inlane ball sensor, two targets, two sinkhole optos and the left bumper lane rollover switch. When I looked over the switch matrix table in the manual to find this out, I also discovered that a separate column for the cannons (home and mark positions) is controlled by transistor Q11 on the 8-driver board and because both of the cannons never find their home position, I now know that three transistors on the board don't work! It seems that the lower half (four transistors for flashers and drop target coils) is working and the upper half (three transistors for guns/diverters) doesn't get CPU signals. Regardless of the 8-driver board, I now know that even the CPU board has a minimal failure which could be due to chip U20 which was soldered to the board by hand (it was obviously replaced; this chip commonly fails as I read on the web). 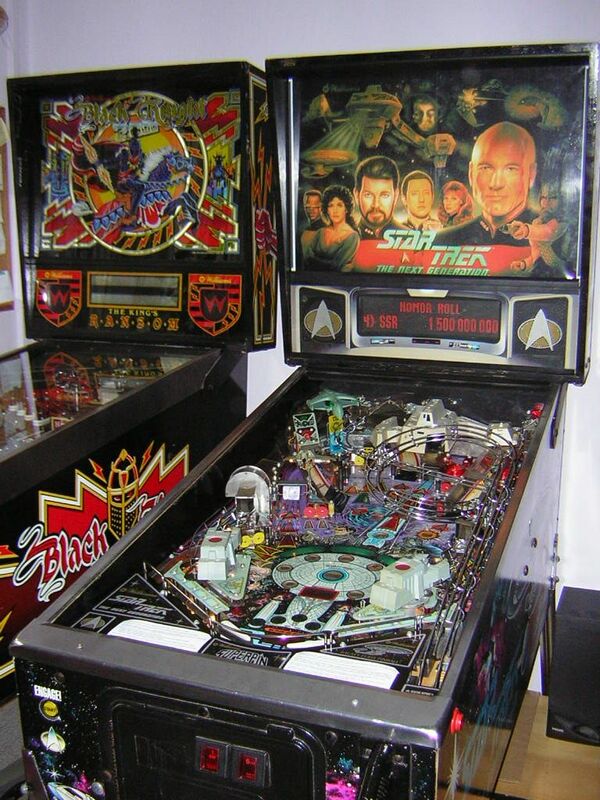 To test whether it is really the board itself, I removed it from STTNG and installed it in The Machine with the appropriate game ROM chip which I switched from The Machine's CPU board to STTNG's board. The Machine booted, but as expected a whole row of switches failed to react, so it is really the CPU board and most likely one of the chips on it. I did not lose any data from The Machine in this test process because I left her CPU board untouched and later put the ROM chip back in. I called drugi because he is still in Berlin this week and asked him about the CPU and the 8-driver board. 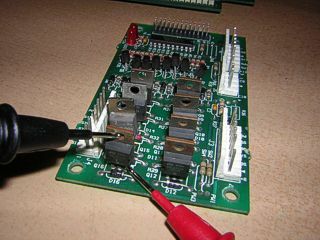 I have not seen any response to my search call on the forum, so the 8-driver board must be repaired just like the CPU board. He said that he will pick up both boards on Saturday and send me a working CPU board as well as the fixed or even a new 8-driver board as the circumstances allow, but this will obviously not be before next week as he has to drive back home and look for the parts first. Still, it's good to know that at least the CPU board will be replaced and repaired. I assume this will cost about the same price as the other boards. I looked over the 8-driver board again and I was still unsure whether it was indeed broken or there could still be another failure on the CPU board which prohibited control of the transistors. Seeing that there was only one way to find out, I decided to test The Machine's intact CPU board with the STTNG game ROM so that I would see how the 8-driver board responds. The problem with this is that I lost all of last year's highscores, my billion score and the statistics as well as the game setup. 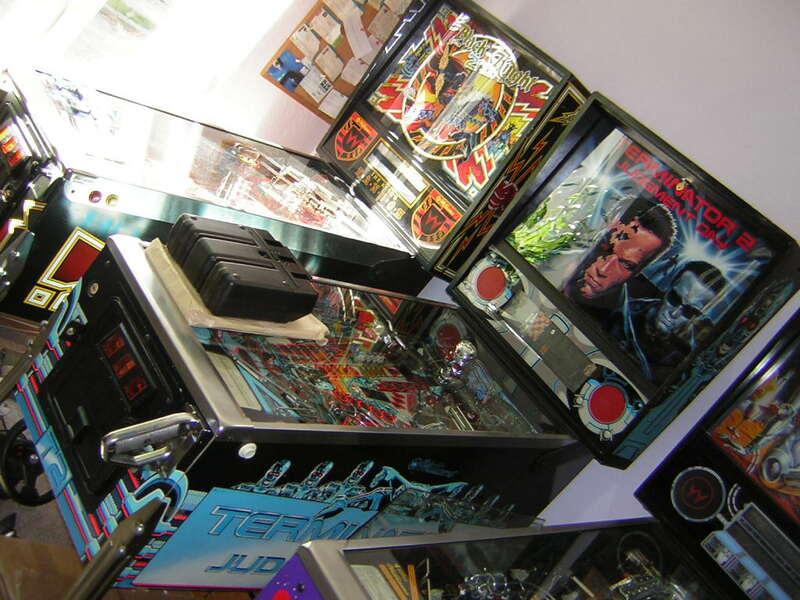 However, in the past months nobody (including myself) has managed to put any highscore on The Machine because of the annoying "fourth highscore = no highscore" bug which I dis-covered and reported on the front page of this website. Plus, the first and second highscore were different by one million which is always idiotic because once these scores wander backwards and become #3 and #4, players need to score very big to even get the fourth place (although this again would be prevented by the bug >_<), so... I decided that a highscore loss (meaning a reset to the default scores) was not only acceptable, but even pleasant for everybody who plays The Machine here, and lately my friends have been playing her much more than I have, not being able to get a highscore because of my astronomic numbers (to them they are) which have been standing unchanged for at least half a year. 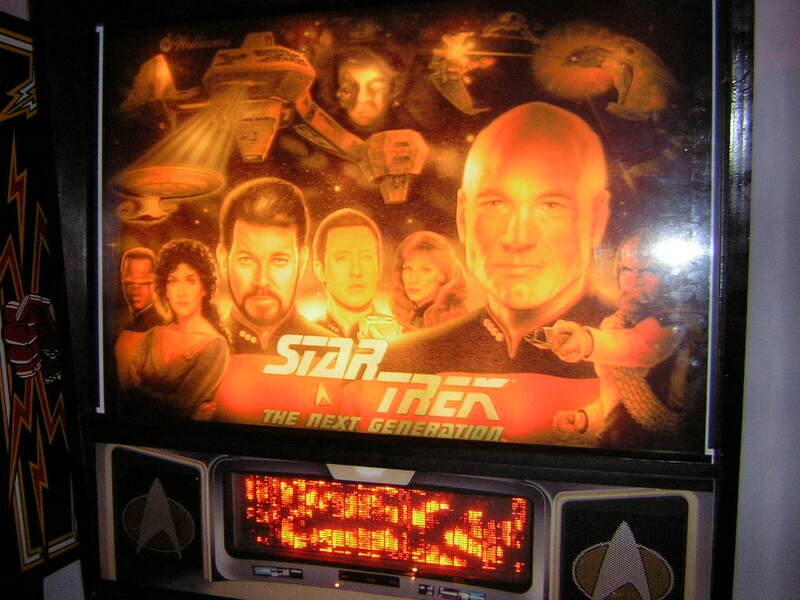 Plus, whenever I start to play The Machine for real again (after I made my peace with STTNG), I will have to face the challenge of putting my name on the list again, and this time with more balanced scores than before! The only loss I'm a little bitter about is the billion score. However, since I still manage pretty easily to get metamorphosis and spinning the big wheel is not impossible at all anymore, I might be lucky to get the billion again sooner or later. To go back on topic, the result of the test was almost as expected: the switches now all work, but the 8-driver board still fails to energize the diverter coils and gun switches. Now that I know this for sure, I have at least a good feeling about giving two boards to the board repair master and knowing it's the right decision. I still have not heard from the seller of the machine and I still need the legs and the opto boards. I guess he is on holiday for two weeks, so I hope to get a response next week. I also sent out the damaged DMD to the seller a few days ago and it should have arrived by now. I hope he will see that the damage is not mine and will send me a replacement display so that I can finally see what difference 143 Euros make to the garbage I'm seeing now. The boards were picked up today and drugi said he will try to fix them as fast as possible. We both assume that the chip on the 8-driver board has failed which could be the cause of the death of the upper three transistors. 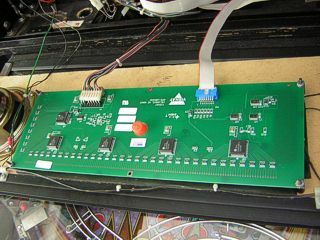 He said he will probably not have too much trouble repairing the boards, and he even offered me to send a working DMD and ball trough opto boards in case I still won't have them when the boards are fixed. 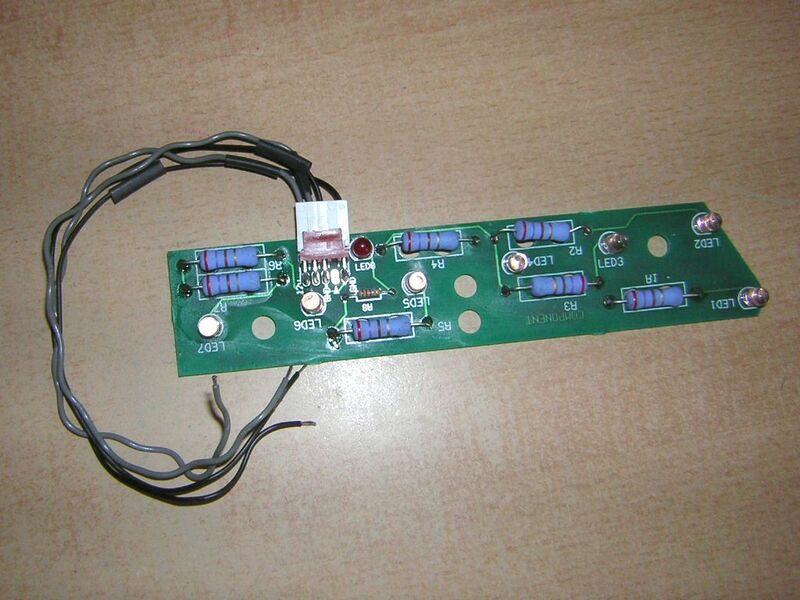 Since I have paid money for the new DMD and I'm demanding a replacement from the seller, I don't think another DMD would be necessary, and I also hope that the seller of the machine will return on Monday and respond to my messages so that he can finally send the legs and opto boards to me. I bought them together with the game, so I can rightfully demand them. I just hope this will work out in the end. Today a brand new Vishay DMD arrived which I bought from the same forum member who got my T2 (and who still needs the legs I'm currently using). I've had a little arguing with the seller of the broken DMD who turned out to be an obvious oddball in the Internet pinball scene, but he "agreed" to transfer my money back to my account, so I was able to buy a new DMD from a reliable source. I have not yet tested the display since the machine cannot be turned on without the CPU board, but I'm sure it will look pretty. 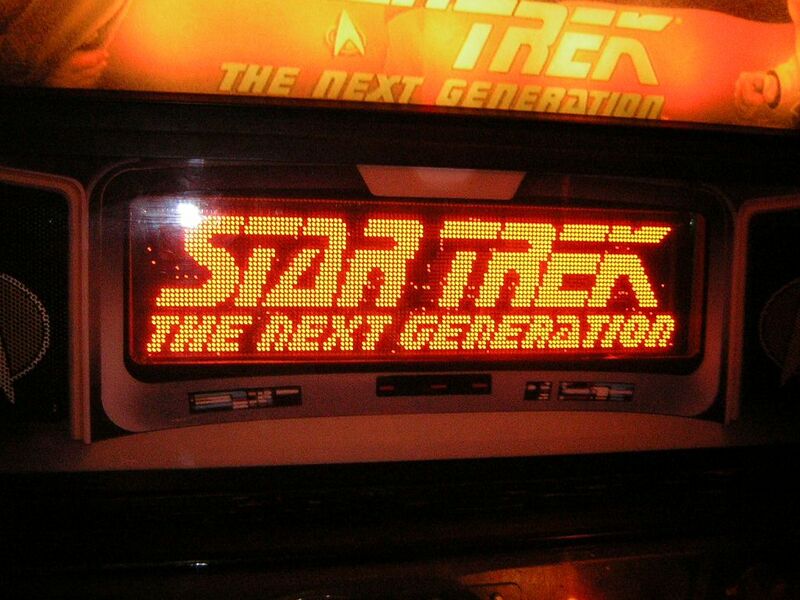 Star Trek: The Next Generation is now playable! The repaired CPU and 8-driver board arrived today and as drugi told me, both boards had cracked traces as the major cause for the problems. 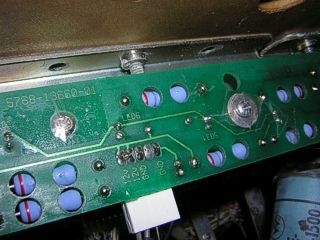 In the case of the 8-driver board, the trace which grounded the transistors was broken which meant no grounding to the coils and switches even when the transistors were turned on. 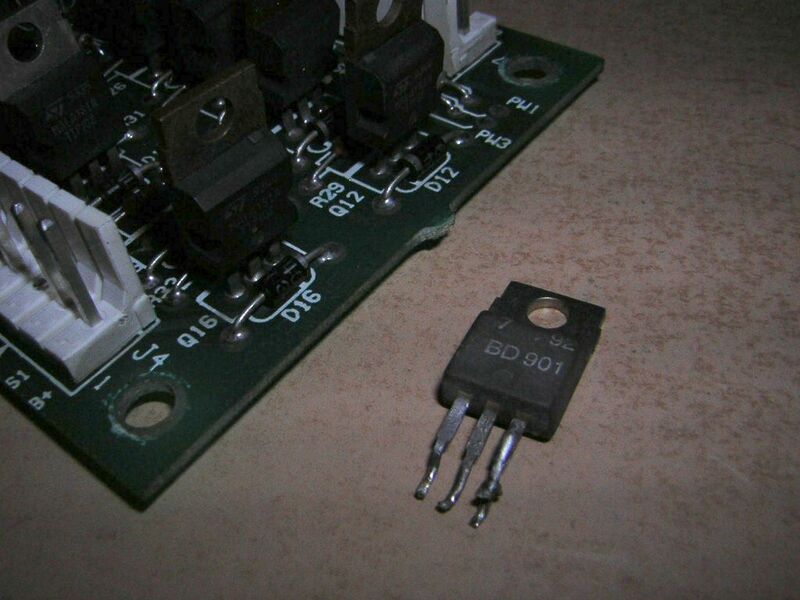 Also, the last transistor I removed from the board thinking that it was not needed was put back in by drugi because, as he said, there was an error in the manual and the transistor is in fact needed for one of the cannon switches. 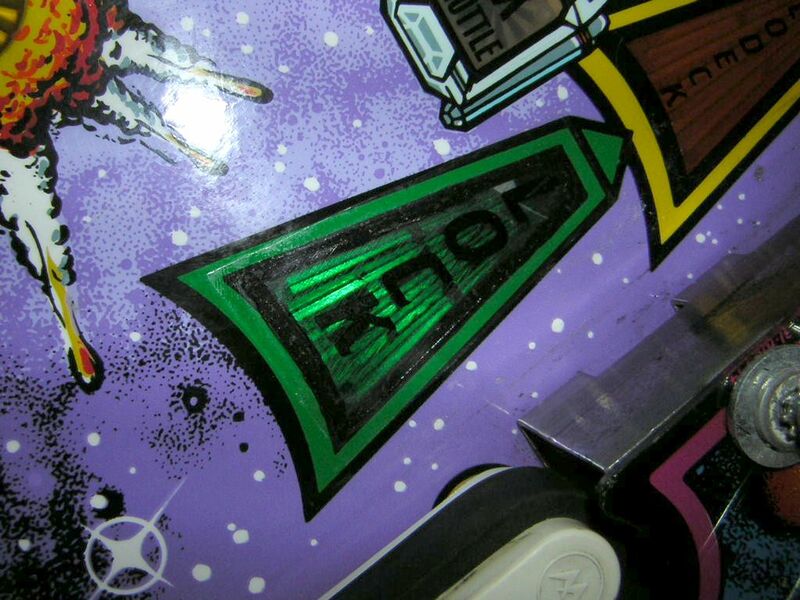 When I unpacked the boards, I also found a sheet in there on which he had written a message saying that a "surprise" was included for rental so I could play the machine even in my current situation. 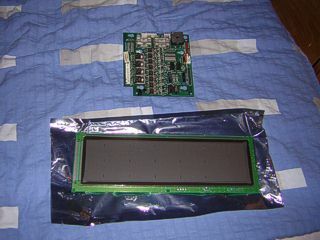 It turned out to be the two missing ball trough opto boards which I still didnt receive, and the seller who owes them to me along with the legs and sound ROMs can't be located, neither by me nor the other forum members who have business with him. I have his phone number by now and I'm trying to call him every day, and I hope to be able to negotiate the situation with him once I'm successful. 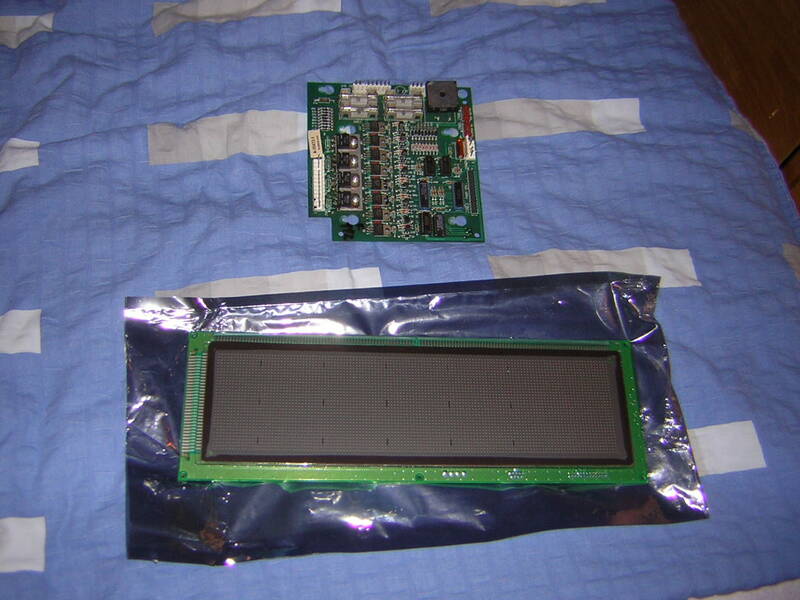 For now I'm glad that I was given opto boards for rental to play the game until I finally get my own, be they sent by the seller of the machine or bought from the forum (if there is no other way, I will). drugi even remembered that two of the wires for the larger ball trough opto board connec-tor were cut off (I had soldered them together knowing that voltage needed to be passed through them) and sent a self-produced connector with four wires along with the opto boards. 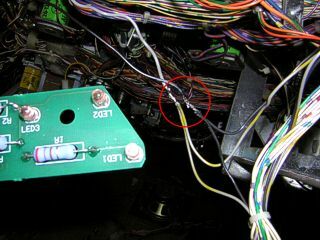 At first I didn't know where to put these wires, but I knew that this was the small connector for the second opto board which was missing all the time on my STTNG (and I was hoping to find it one day), so I figured out from the manual that only two of the four connector wires were used by the machine and these had to be attached to the two cut wires from the larger connector. They were originally looped through the smaller connector, but since this self-made one didn't feature a loop, I simply attached the two wires to the solder joints of the installed wires, so now both boards had voltage and grounding. Installing the boards was a tough task, though. 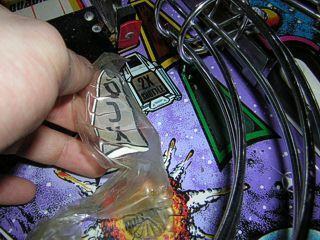 I was missing the screws for the ball trough to hold the boards in place, and I figured that I needed to get a least four screws together from the "collection" I have lying around from both pinball and computer repairs. Finally I found two longer screws which fit into the trough and were board enough to hold the boards in place, and I stabilized both boards with another two screws which fit exactly into the trough without the boards attached, but worked well as a "stopper" to hold the boards from moving. You can see how I did it on the photos. It's not the best solution, but it worked. Before I installed the boards, I tested the machine without them to know whether it was at all possible to play a game without them, and with only the fixed CPU and 8-driver board installed. 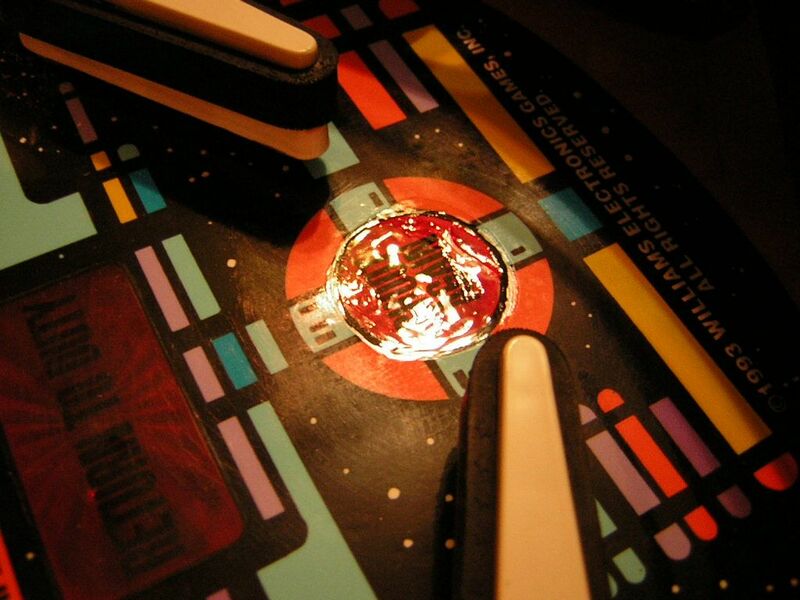 However, even though the balls now sat in the correct locks under the cannons, the game still shot multiple balls into play because it couldn't logically sense that all necessary balls were in place, so the opto boards were absolutely needed. After installing them, the game accepted the balls and started. 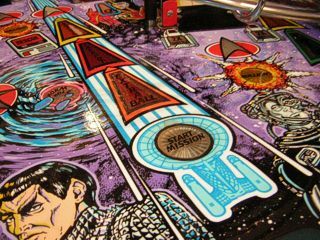 The DMD looks extremely sharp and vibrant, and it's a very different feeling to play the real machine after all this time of playing STTNG on Visual Pinball (which is just not an acceptable simulation). 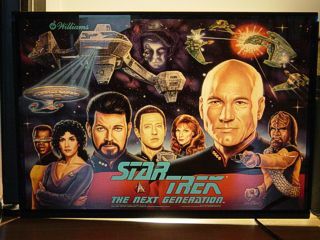 Of course I will write the real article about STTNG's gameplay and features in the coming days now that I have the chance to experience my own machine. It might have been cold solder joints causing an intermittent connection with too much resistance to flow clear +5V to the CPU, resulting in resets. Fixing these solder joints twice should hopefully do the trick. I've reached The Final Frontier... after only three days of play! This was pretty fast and not all that difficult contrary to what I heard from other players. Of course you "only" need to start all missions and not even complete them, but I still thought that even this part of the game would take me a little longer than three days to achieve since STTNG is a game with a very different feeling... it is incomparable to all other machines I've owned and I practically needed to learn precise aiming from the start after I noticed how different the machine plays. 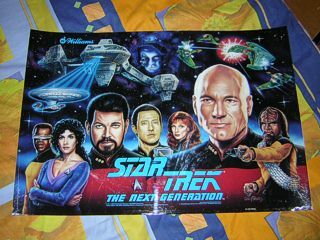 Still, I must have become a better player than I thought and because I'm not disappointed at all at the fact that STTNG has not challenged me as long as I wished, I must say I'm very surprised and pleased that the game is not "undoable" for a medium skill player like me, and the challenge still remains to get all the artifacts, warp 9.9, all the multiballs and jackpots, and to hold The Final Frontier longer than 30 seconds (which it lasted; it's damn hard to even look at your target while having six balls in play!). And while I had the chance three times today to finish all missions to start FF, I only made it there once, and with a lot of extra balls. 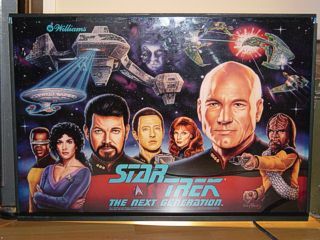 So... STTNG keeps me on my toes, and it's so damn addictive! It's exactly what I wished for, a pinball machine which keeps me coming back even if I'd have better things to do. I also made my first acceptable Grand Champion score with 4.7 billion after this extensive game. While playing, I discovered several things which didn't work exactly like they should: for example, in some missions it occasionally happens that the machine throws out the locked balls and you have multiball whereas you shouldn't, and shots into The Neutral Zone are often recognized as Advance in Rank or Command Decision (which is the sinkhole left to The Neutral Zone). 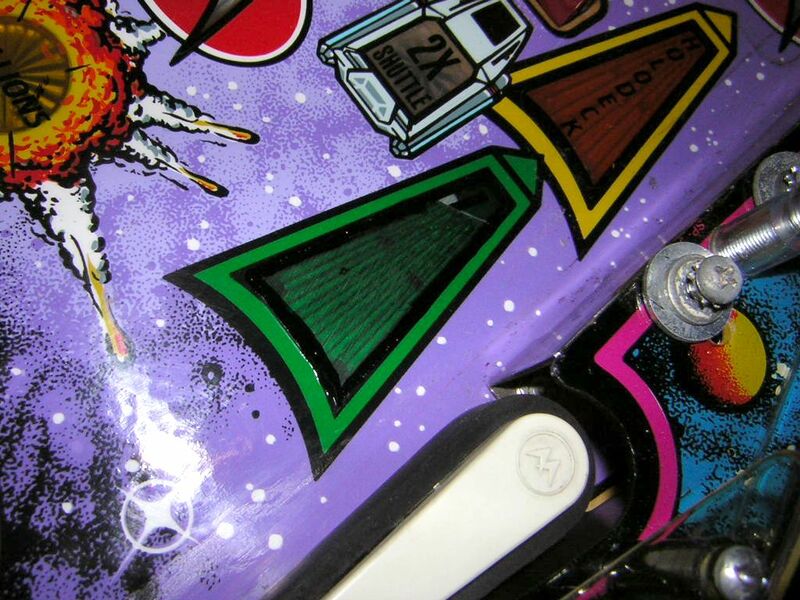 On some occasions a slow shot which drops into The Neutral Zone and takes a while to roll down the under-playfield ramps will not be registered as a hit, and just come back out from the ball popper. 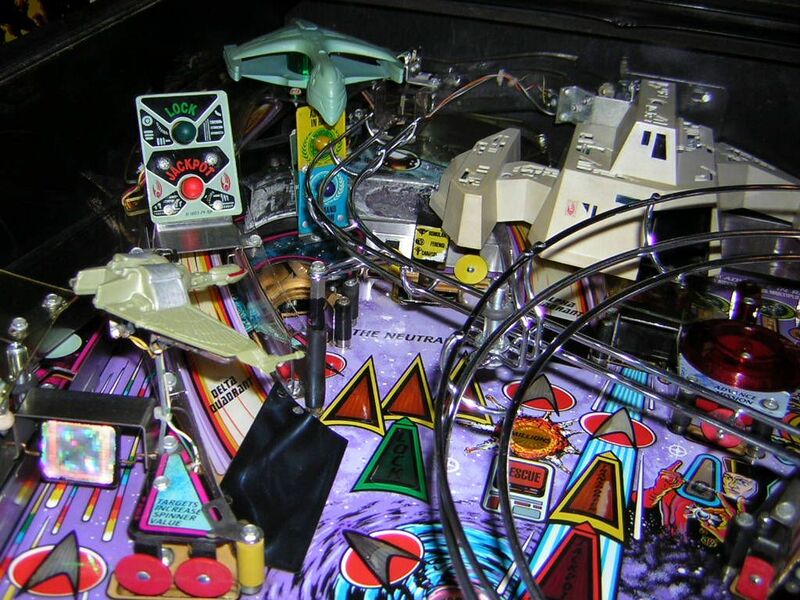 I assume that all of this will go away once I disassembled the components under the playfield for cleaning, especially the ramps which are extremely dirty and corroded and left a great deal of rust on the installed balls. The shiny new balls I got from Frank suffered from this corrosion immediately when I put them in for a test gae before the machine worked, so I'm still playing with the original balls until I cleaned the game and removed the corrosion. Damn, the resets still occur! Yesterday I was unable to play the game at all because I didn't have all the time to open and fix it, so I looked over the recti-fiers again today and made sure that all solder joints had flawless continuity to the corresponding capacitors and diodes. As suggested in Marvin3m's repair guide, I jumpered the two most important board traces with two wires on the underside of the board and also tested the two AC voltage points of the recti-fier, and nothing bad was visible! But all of this didn't help as the machine now even resets randomly when I hit one flipper button only, or in attract mode. 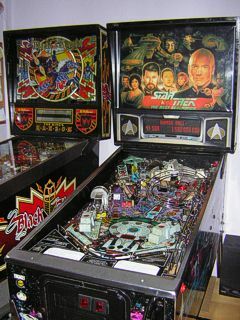 To overcome all of this, I decided to remove the power driver board from The Machine and put it into STTNG. Naturally the game now works flawlessly, so it has to be something with the rectifiers since the solder joints test correctly. I cannot believe that BR2 (the one responsible for smooth CPU voltage) might be broken after only three days of operation, but if it's not the device itself, it has also been suggested on the forum that I replace all of the bridge rectifiers (five) and see where that leads me. When I analyze the other problems that came with the power driver board and have now disappared, I see that this might indeed help, at least to solve the other stuff: before I exchanged the board, the left flipper button opto always "flickered" as the button was pressed, resulting in a fast rush through the lane change and selections on the display. The right flipper button optos were not affected. After installing the other board, the problem dis-appeared and on top of this, the right cannon now moves visibly faster than before, contrary to the left cannon which still has the same (slower) speed. However, since this board is 100% intact, it must be the correct situation and the slower cannon movement and flickering opto on the original board could have to do with the 12 volts coming from BR5. If I exchange all five rectifiers, all of the problems (inclu-ding resets) might disappear, or I'll be forced to turn the board in for repair. 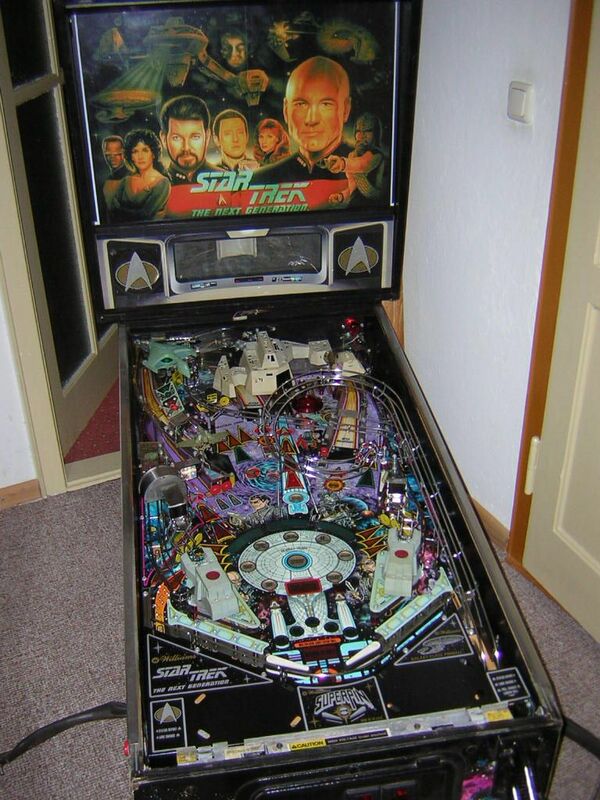 For now I am playing STTNG with The Machine's power driver board since she is not played at all by me at the moment, but since STTNG's board is incompatible with The Machine because of missing parts, I'm motivated to solve the problems with STTNG's board as quickly as possible. 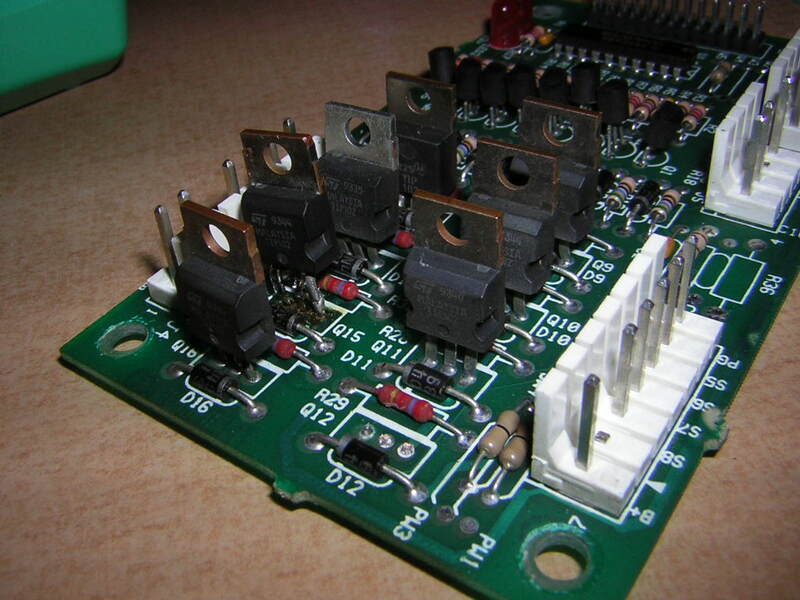 I saw five 1000 volt bridge recitifers in an auction on eBay today and I might just buy these to replace all five on the board including the fresh (but possibly broken) ones that cause resets. There is more to this than meets the eye. Yesterday the machine failed to boot after being switched on, and it took five minutes of waiting until it had "warmed up", and after this it wasn't reliable at all. After testing and swapping boards with The Machine (CPU board was ex-changed as well since the new scores on The Machine aren't very meaningful yet and could be discarded), I found that measuring voltage directly on the CPU board was the best way to figure out whether there was actually a voltage problem present at all. 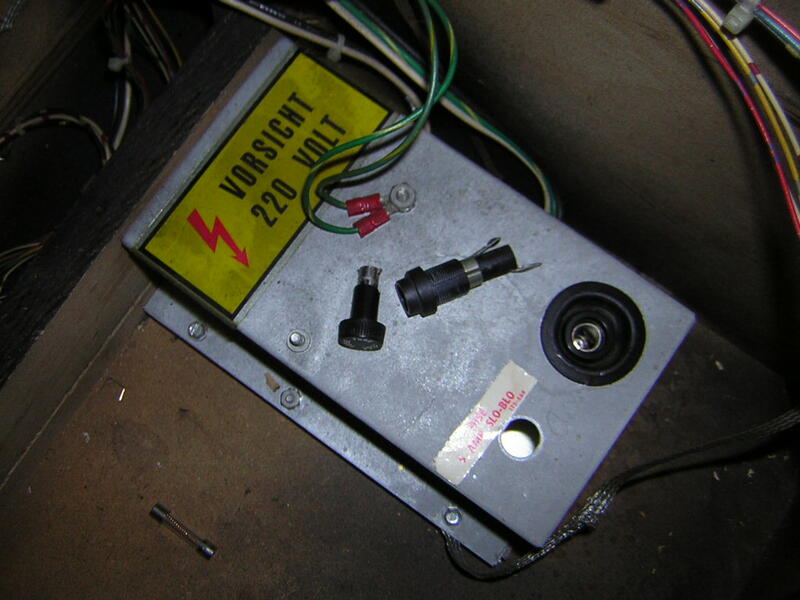 The voltage coming from the power driver board was within acceptable limits, only the 12 regulated volts to the lamps and the 18 unregulated volts to the GI (?) were fluctuating because the more lamps turn on at the same time, the more power they draw and the less power the board can carry (the lamps become slightly darker). 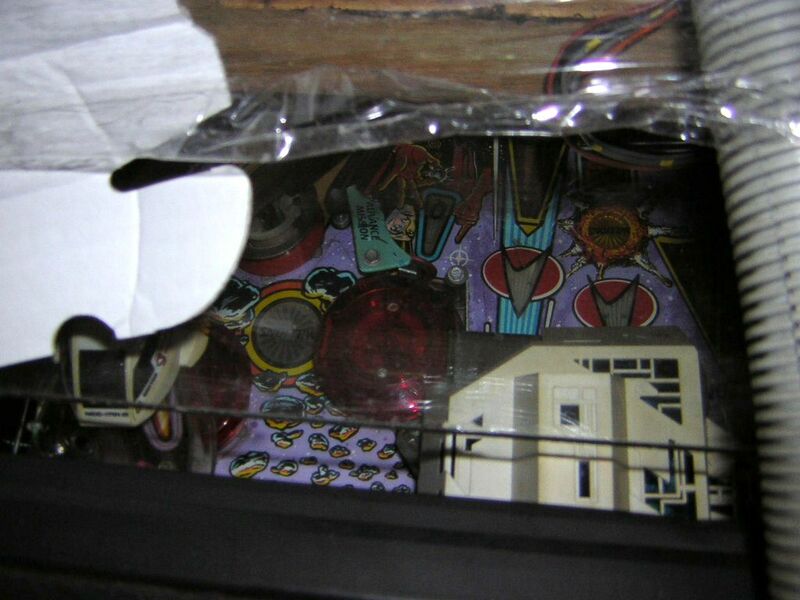 As I was told in the forum, this isn't a reason for the CPU to reboot itself, and I've seen darken-ing lamps as a result of age on other pinball machines. What I saw that solved the mystery was the voltage that arrived at the connector on the CPU board. While the power driver board sends very stable 4.94 volts to its connector, only 4.89 volts arrive at the connector on the CPU side, and while the machine plays absolutely stable on 4.89 volts, in the time of reoccurring resets yesterday afternoon I measured down to 4.79 volts (!) which was obviously too low for the CPU to be stable, resulting in permanent and unpredictably timed resets. The rest of the day (two friends of mine arrived and we played after I had completed my measurings) the game played stable even though I had not turned it off and back on or exchanged any-thing after the last reset - I had only stopped measuring voltage, closed the backbox and left the game alone, however it played fine for the rest of the evening. And the same was today, the whole day was no problem for the game, not when booting up after switching on and not when playing. I measured constant 4,89 volts at all times at the connector on the CPU, and the result was flawless operation. The solution to all of this is that it must be the connector. 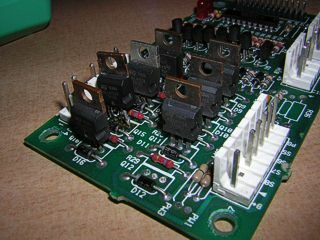 At first I suspected the bridge rectifiers which had been replaced on the original power driver board, and I resoldered them from both sides and even jumpered one of them for maximum security, but it didn't help. Next, I swapped the power driver board and the game played fine - until the next day. Then I swapped the CPU board, but the result was the same. And after all of this, none of these components were problematic! If there is sufficient voltage coming from the power source but insufficient voltage arriving at the destination, and if this voltage alternates between sufficient and insufficient, then it must be the connector. 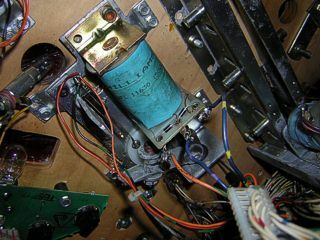 I established this theory after measuring from hour to hour while the game was running today, and I found that both connector pins carrying the 4.89 volts had voltage only on the lower brackets; the upper brackets were completely dead. Since the brackets are on the same pin, the only reason is that the connector is faulty, either it has too much resistance or the wires have poor contact with the pins. 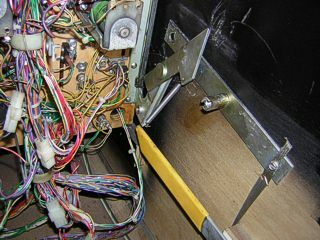 In any case, this is what caused the irregular drop to voltage below 4.8 volts and reset the game, because today I could hit the flipper buttons as many times as I wanted and nothing happened, coexistent with the stable voltage at the connector. I don't know how I can solve this since I have neither a connector for replacement nor the tools to crimp the pins. But some way or the other I must find a solution to this, and until I have, I'd best keep my eye on a securely seated connector if the machine decides to reset again. I tried to negotiate a deal for an original STTNG backglass translite because the reproduction I have looks awefully cheap. However, this guy insisted on a price which was too high for me regarding that there are two relatively large scratches on the artwork which were clearly visible on the photos. For the same price I could get a high quality reproduction printed on plastic, however I don't know whether this would be a better deal since it is still a reproduction and not an original. Since I received a lot of money today, I might reconsider the purchase of the original translite because it's the only one I've been offered. 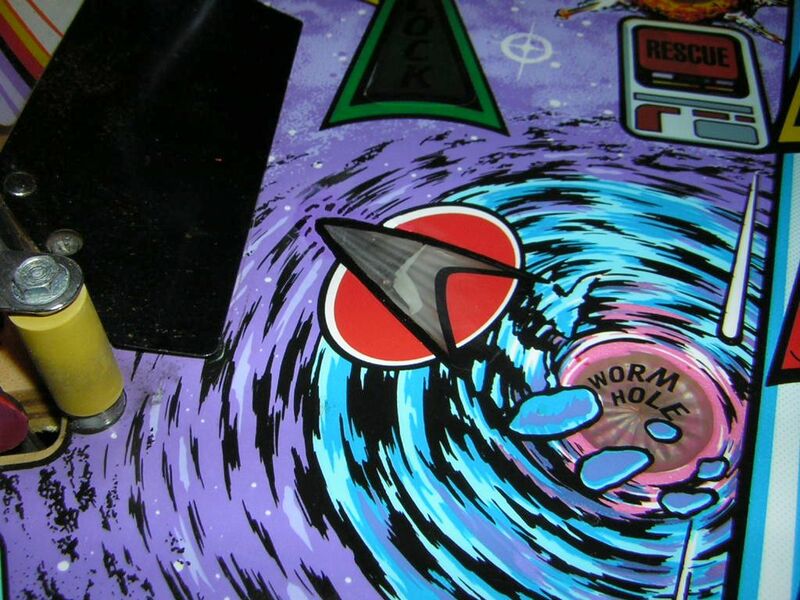 Also, the black rubbers I ordered specifically for STTNG arrived today and will be installed when I do my cleaning sweep of the playfield by the end of next week, after Stargate has arrived. I have decided to buy the original translite for a little less than the original price. The seller agreed to it, but said that he will send it out only on Monday, meaning it will be here sometime next week. On the left photo you can clearly see the two scratches, one on Worf's arm and the other (smaller) in the upper left edge on the Borg ship. On the photos which were taken without a backlight, the scratches are much less visible, so I think that it won't be all that disturbing unless you look for it. 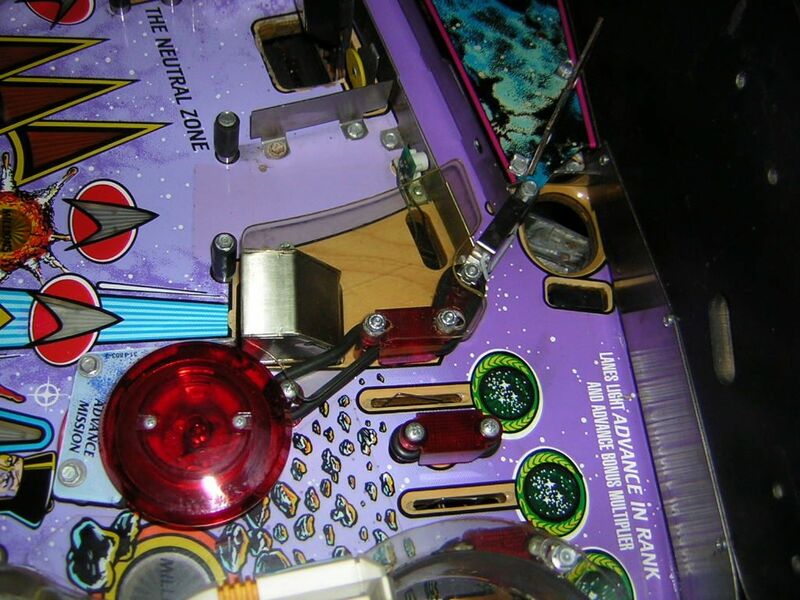 I removed the mylar from the playfield, but while it started to go off very well, leaving little traces of glue on the playfield, the damage that had already appeared through the mylar in the upper playfield area became only worse. The flaking that the mylar had up there was hard to get off to begin with, but with it came down the right "lock" insert's coat and lettering, the upper center Starfleet emblem insert's lower paint, and the Borg ramp emblem insert's upper paint, which was especially ugly. 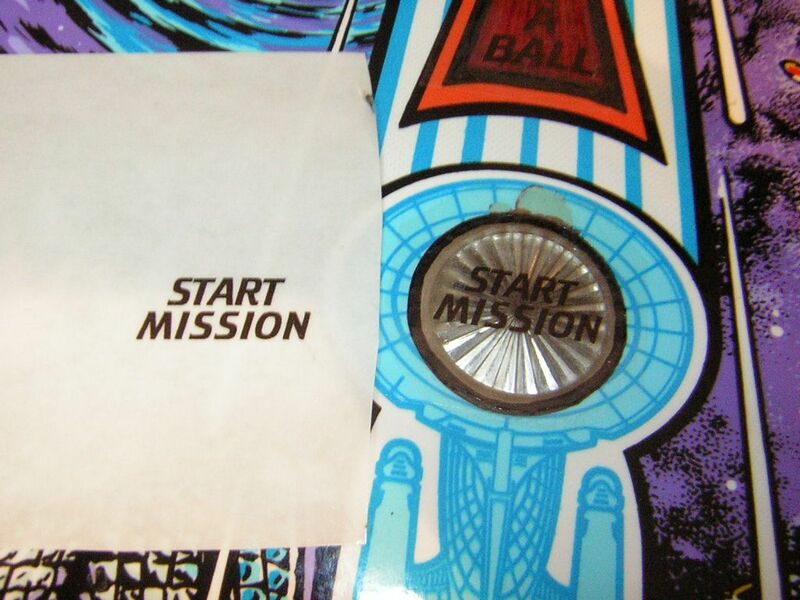 Obviously the coating, Diamond Plate or not, had leveled from the inserts under the mylar and the damage now looks similar to the "start mission" and "extra ball" inserts. 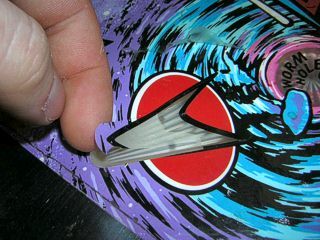 But the mylar and glue is off... now it's time to retouch the inserts with the best of my skills. Also, the new backglass translite arrived today and is now installed in the backbox. It makes a huge difference in detail and colour! 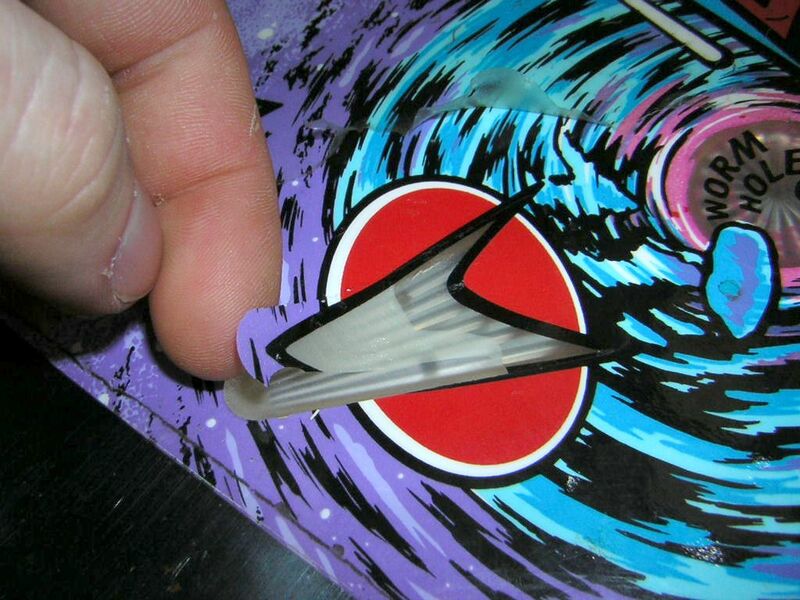 The touch-up of the damaged inserts went through in one day and the results are much better than I expected. I went to the nearby arts & crafts store and invested roughly 20 Euros in some good quality brushes for acrylic paint since I wanted to make sure that this time any straight or curved lines would come out as clean as possible. 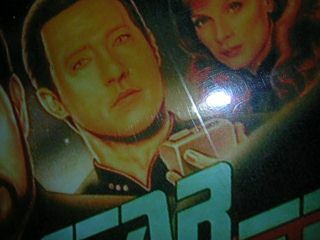 I also purchased more colours of acrylic paint because the ones I used for The Machine aren't sufficient for STTNG's different colour scheme. This investment turned out very positive as I could do all the retouching with the same brush and lines were relatively easy to do. It took me only a few hours to finish all the colours on all inserts. This time I used a trick I read on the Internet; it says that fingernail coating can be used instead of normal (thicker) coating which I used on The Machine where it left some evident traces (brush traces as well as a thick layer of transparent residue)! Since the "shoot again" insert had its coat lifted and a little piece broken out, I tried to close or at least protect this spot from wear and put three coats of trans-parent fingernail polish on it. 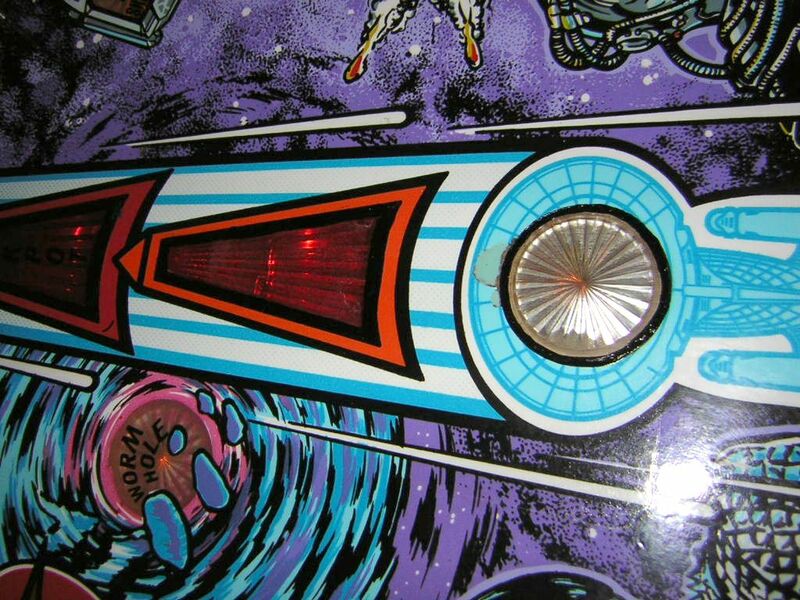 On the photo it mirrors the surrounding light and it's visible that there are some brush traces and waves, but these are minor and you cannot see or even feel them when you look at the playfield from a player's angle. The coating survived being sanded down, so I think it will widthstand the pinball - however it remains to be seen whether the other more heavily travelled inserts are just as forgiving. 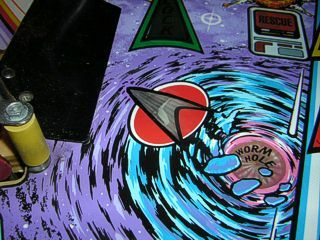 After I had finished the Borg ramp insert, I couldn't deny I was proud. It does look retouched and you can see where the original coating broke off, but I will seal that with fingernail coating today, hoping to see a smooth transition. As for the touch-up's traces, you have to look close to recognize it as being retouched; in normal play it's practically out of your focus. I will print decals which I made on the computer on self-attaching film that will be pasted on the three inserts with missing letters. The film will then be coated to protect the printing. 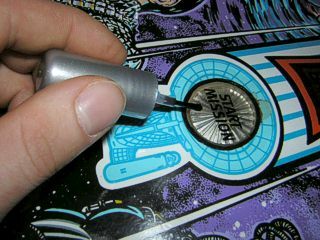 It's probably the easiest way to replace lettering on inserts, but I don't know how long it will hold. The restoration is finished! After touching up the inserts, I went to the same arts & crafts store where I buy my acrylic paint and asked them for printable film, and to my surprise they offered me self-adhesive film for inkjet printers. Since I have a (crappy) inkjet printer and no nearby copy shop makes laser prints on film, I chose to try it out at home with my printer. Another surprise was how good it turned out. My printer, which normally creates quite ragged letters, made an almost perfect print on the film, however I noticed that the ink still had not dried after one hour. I don't know whether it had to do with the time, the film or the ink, but since I wanted to coat the film any-way to protect the ink, I cut it out in the rough shape of the inserts and pasted the pieces on them, leaving enough margin to cover the painted frame. Then I put three coats of fingernail polish on them which instantly protected the ink and probably helped it dry, and the problem was solved. After an estimated 50 games the film does not seem to show any loss of stability and the polish coats protect it from scratches as well as surface detaching. 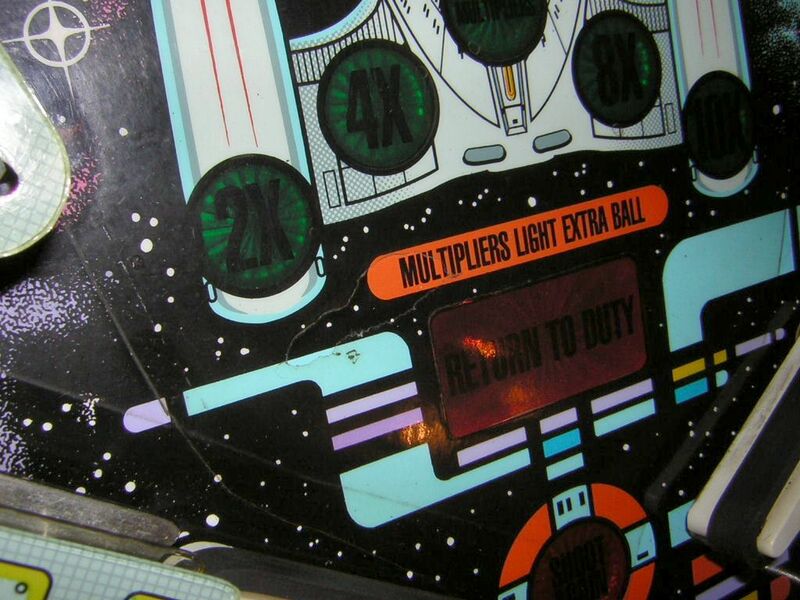 When the machine is turned on and the inserts are lit, it's very hard to see that the text is printed on film and it looks just like the original (I used the same Star Trek font to create the lettering). 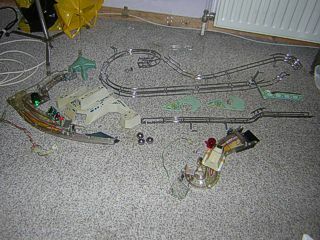 Afterwards, I disassembled part of the playfield and found out that many parts can be detached as one, meaning that the playfield could be stripped in a matter of an hour. 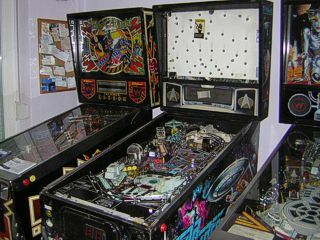 I cleaned everything, put new black rubbers in every location and waxed the whole playfield, then put it all back together. The ships and cannons still look yellowish because the dirt and nicotine on them didn't come off very well even with isopropanol, but you don't notice it unless you look for it. The ramps were not particularly dirty to begin with, so they look fine. 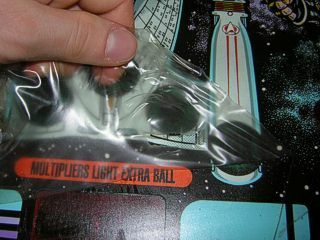 A little teardrop goes to the plastics as some of them are broken or missing, especially the one to cover the Advance in Rank sinkhole plastic so that the ball does not jump up and land on it (which happened once). 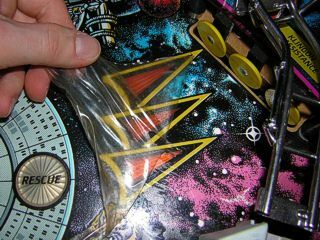 Since this is more technical than cosmetic, only the two broken plastics above the six yellow targets on the lower playfied are visibly damaged. 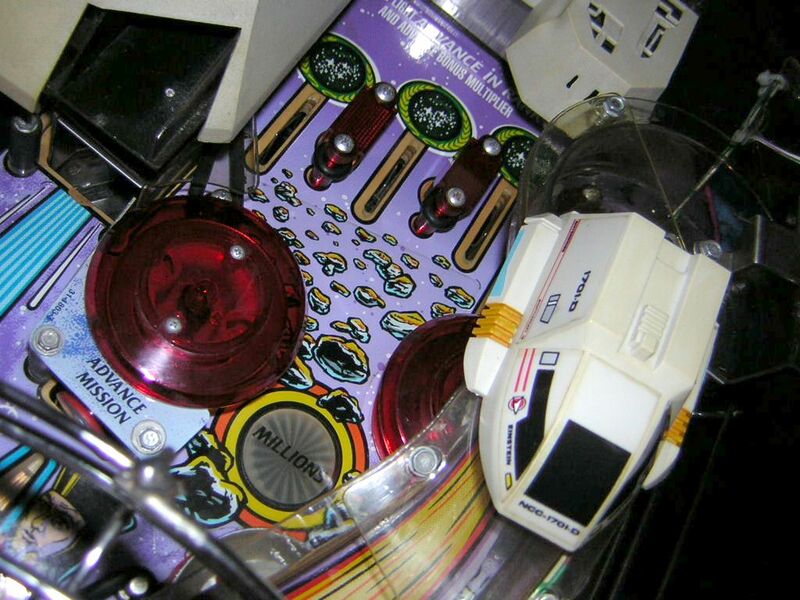 With the machine working after weeks and the playfield touched up, this is only a small thing to worry about, though. 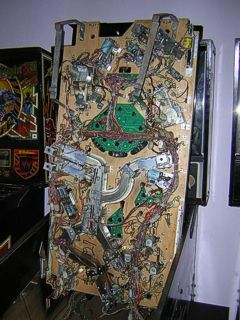 To finish up the process, I screwed off the under-playfield ramps which are one part as well and can easily be removed as long as you are willing to untie quite a number of 1/4" nuts. 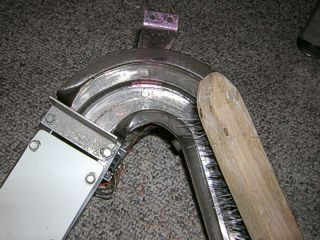 Just unplug two connectors and take the whole assembly out with the diverter coils, and you can start cleaning. As recommended by Frank, I used a wire brush to get the heavy dirt and corrosion off the metal ground plating. Of course this resulted in some scratches in the plastic walls, but since nobody looks for them under the playfield, it doesn't matter at all. After I had loosened all the dirt, I wiped it away and cleaned the plastic walls with isopropanol, then put the ramps back in. 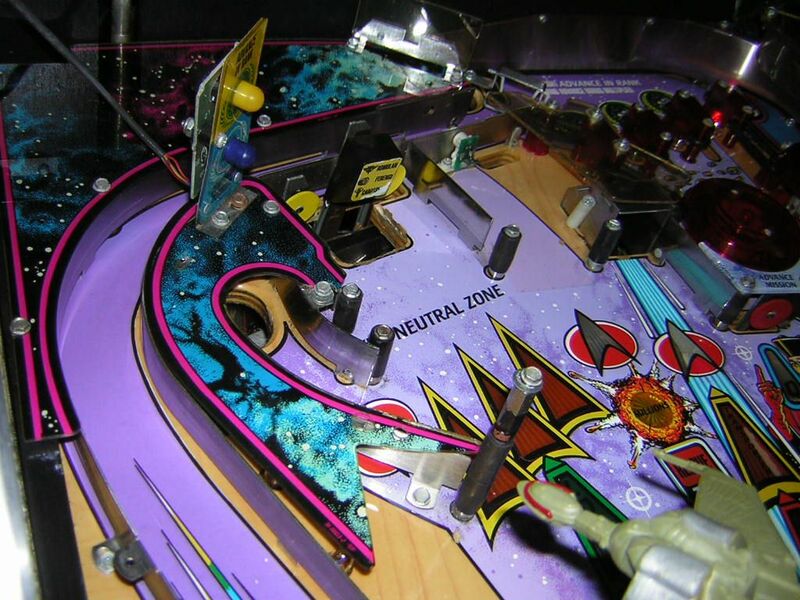 It is vital that this part of the playfield is clean because no matter how shiny the playfield looks on the upper side, the balls will catch the dirt from the ramps under the playfield and spread it around on the surface if these ramps are not clean! 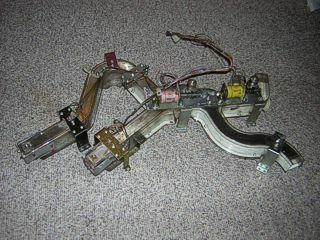 I think this is the last entry to this log page because the machine works, looks clean and has all the parts it needs. 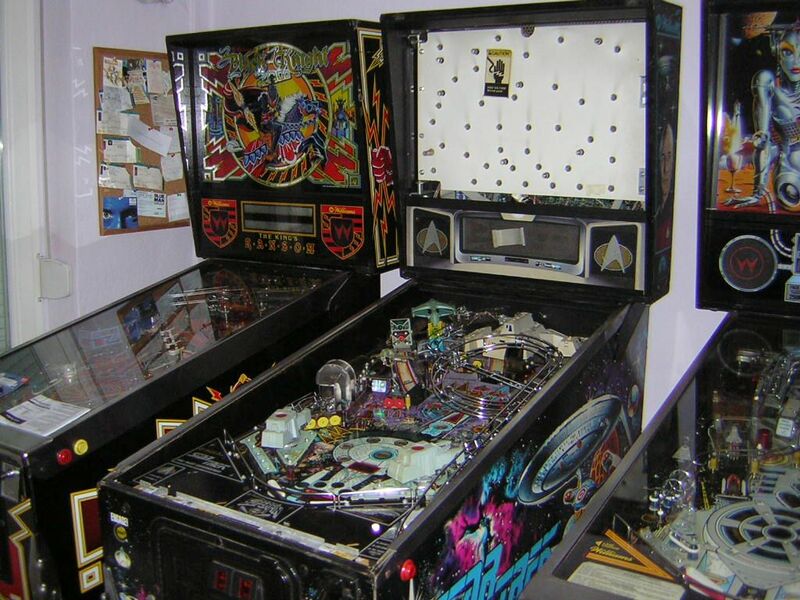 I have solved the reset problem, I will install new bridge rectifiers on the power driver board to get rid of the flipper button opto fluctuation, and the next time I have the glass off, I'll disassemble the left ball popper and clean the optos to avoid the random multiball that occasionally happens in missions. I have also ordered a metal scoop protector for the Neutral Zone sinkhole which will cover the wood. There's not much more to do; I only need to find my own ball trough opto boards in the future so I can return the currently installed boards. 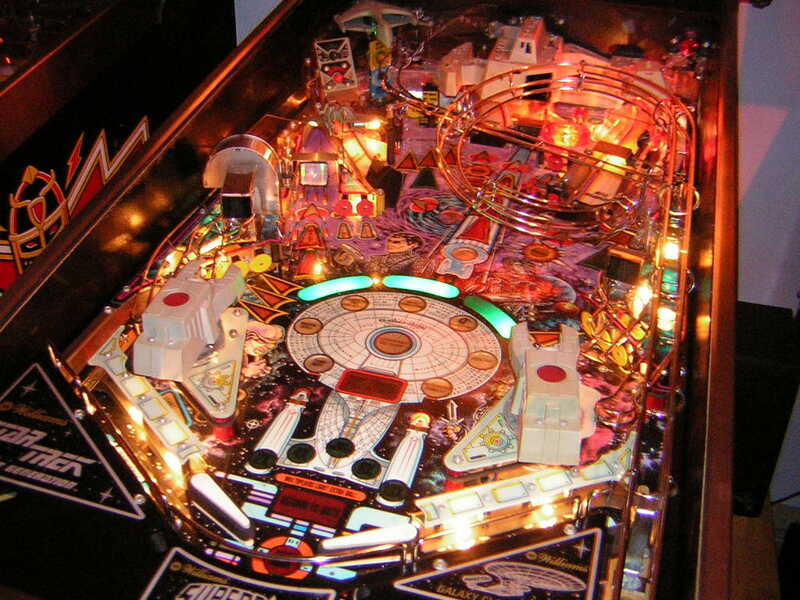 © 2005 Maximilian Schulz - Williams, Bally, Gottlieb and all other names, all pinball games and software mentioned on this site are trademarks of their respective owners.